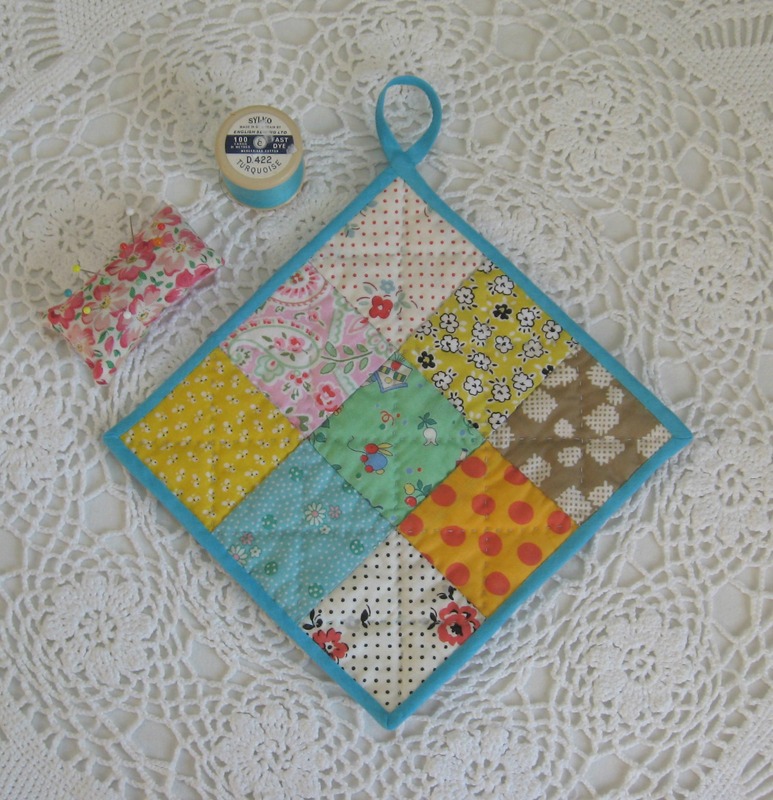 Red Salmon and Iced Orange inspired patchwork pot-holders……. 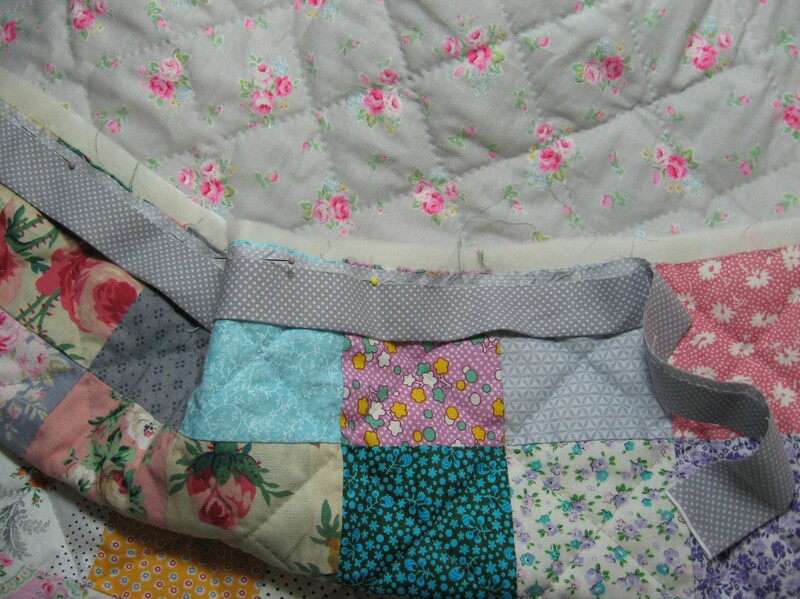 I love sewing my patchwork by hand and generally I use grey, brown or a light pink thread as I find those blend in really well with other colours…..however I do like using vintage threads and Dewhurst Sylko is my favourite….firstly it’s what I remember from my nanny’s sewing basket, it’s what my great aunt used to sew with…and also what my mum used on her sewing machine….and then there are the names…..unlike thread nowadays which uses numbers, Dewhurst Sylko also gave their thread a name….Red Salmon, Elephant, Gay Kingfisher, Iced Orange, Straw, Coco,Chartreuse, Fiesta Pink, Frivolous Pink, Erin Green…..gorgeous and beautiful names that make me smile reading them much more than a number can. I’ve probably got a whole set by now but there’s times when you just don’t see them and then whooo….a big box full and only 50 pence each…….. Inspired by the bright sunshiney colours of my most recent purchase of a handful of rainbow bright threads (reminding myself as I queued up to pay of when I little and I’d stand at one of our village shops with a white paper bag filled with bright penny sweets) I’ve sorted out some patchwork squares and sewn them together to make some new pot-holders for the kitchen……..these ones aren’t very big, just large enough to use to lift the lid on some big enamel pots rather than use to lift the pots themselves….. 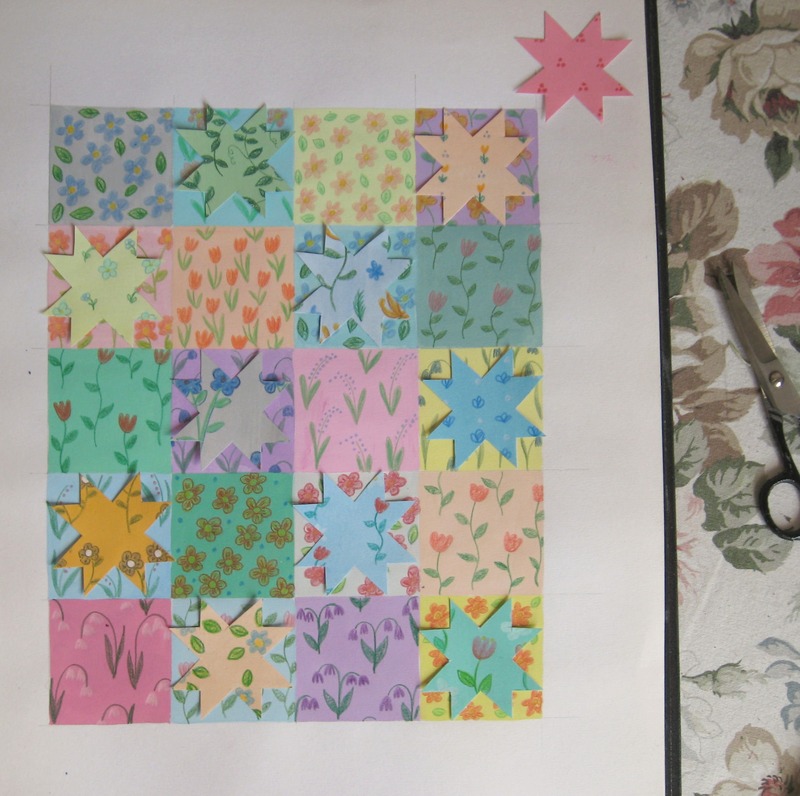 These would have been easy to sew up on a sewing machine, but we had a couple of sunny afternoons so it was nice to just sit out on the back door step with a pot of tea and Bob from next door as company and sew the squares together by hand….. The finished squares are just over six inches wide so when I came to quilting them I just pinned the three layers together….I didn’t use anything really fancy for my batting, just what I had left over from other projects, I think it’s a cotton/wool blend but certainly is all natural…I only used one layer of batting but if I make these for oven hot dishes to sit on then I use two layers and in the past have used a couple of layers of an old vintage blanket. I’ve used the heat resistant batting before but I didn’t really get on with it, I found it sewed up very bulky and stiff so don’t tend to use that anymore, though if I was making oven gloves or pot holders to take things out of the oven then I think I’d use that…certainly not a polyester wadding though. I pin a side and then sew it in place using little back stitches before pining the next side…the corners are mitred which is a bit fiddly but is good practise for when you’re sewing them on bed size quilts….once most of the front binding was sewn in place, I flipped it over and whip stitched the back binding, checking my corners as I go……..
I’ve sewn the sides of the tail together before sewing it into place on the back to make a hanging loop……I’ve given this one a couple of test runs and it’s perfect, just the right size to lift up pot and pan lids and hanging up in the kitchen it makes even the most grey and miserable morning seem a lot more jolly and bright. 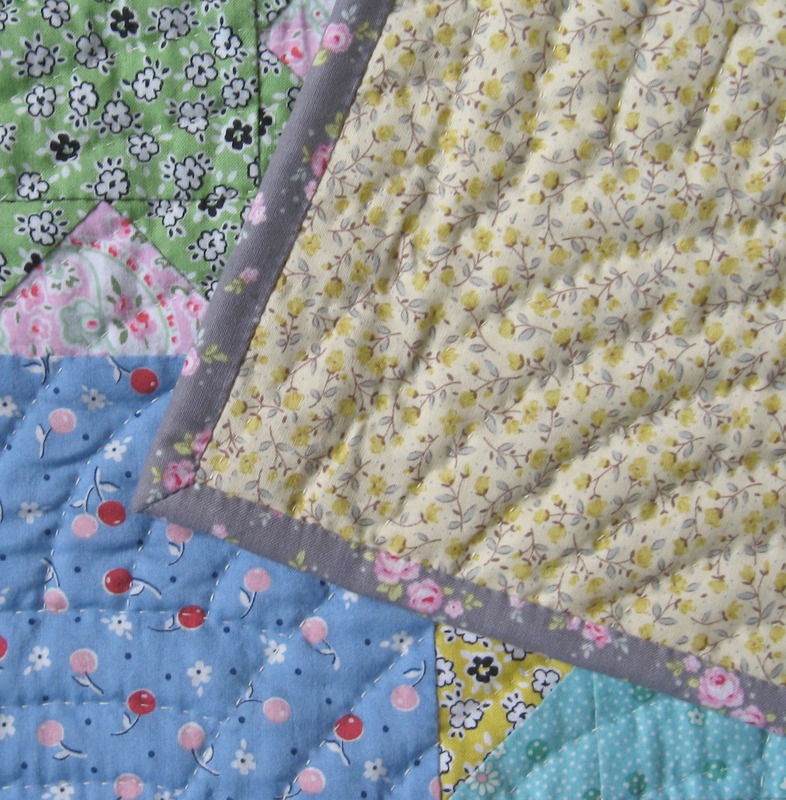 Every stitch by hand………the journey of two little star quilts. 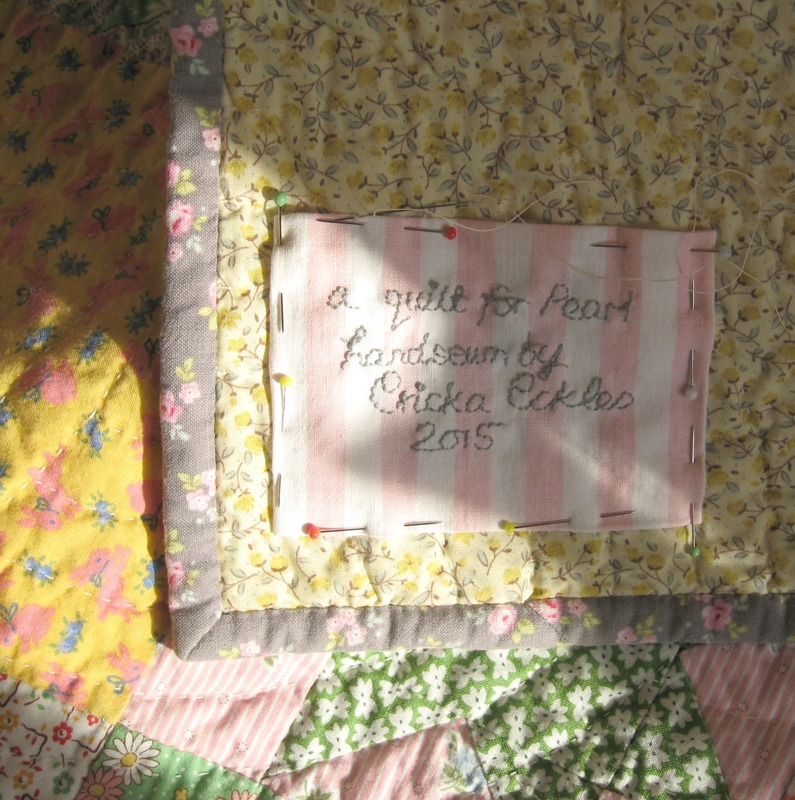 I wanted to write a round up piece about the two quilts I’ve recently finished making…a little journey of Peggy and Pearl’s quilts…….I’ve put in links to where I’ve waffled on about a particular part of the quilt before so I’m hoping I won’t be repeating myself too much. After lots and lots of pots of tea, and many hours spent drafting out designs and colouring them in (even going so far as to paint up papers to create my own little paper patchworks to help with giving the work a sense of the fabrics) I arrived at two designs which I felt happy with….this was in fact helped by a few text messages with their awesome Aunty Ally who said their mum liked stars. 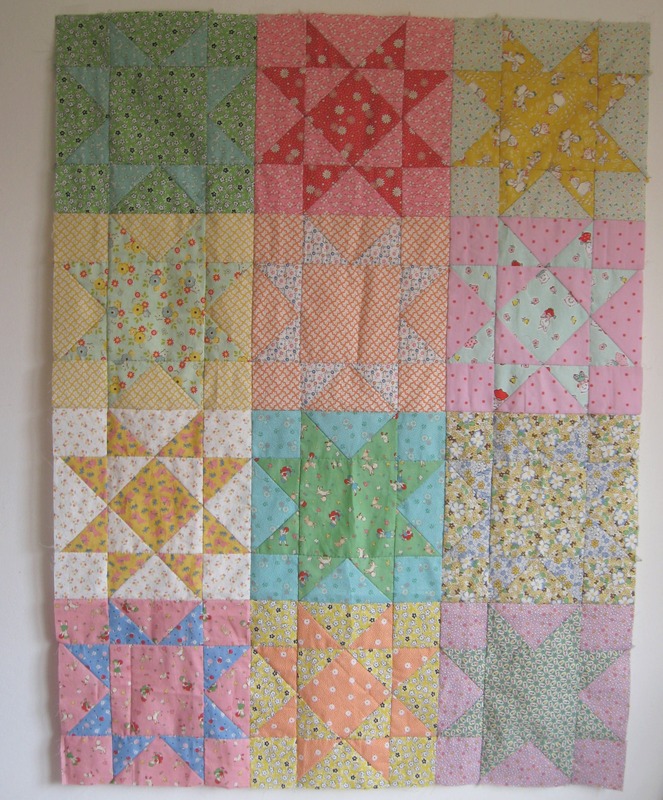 So I played around with different star blocks and incorporated one of the star designs with large squares to tie in with the quilt I’d made Olive. Then I set about choosing fabric. I had a good idea of the sort of prints I was after, but I was seeing so many that I just couldn’t keep track so I made a pinterest board of all the fabrics I thought suitable….once I felt I had a really good selection of designs and colours, I went back through the boards and picked out particular favourites. I also tried to limit myself to the amount of shops I was going to be purchasing from…it wasn’t an easy task and sadly I had to miss out a few gorgeous prints because perhaps that shop only had one print I liked, or only sold it by the half metre. (Because I wanted to use lots of different fabrics I had to limit myself to only buying fat quarters)…..Anyway I whittled down some hundred different prints to about 20 that made my heart leap from three different shops. I never stick to just one designer or company, (though Whistler Studios at Windham fabrics is a firm favorite of mine, and the Aunt Grace range from Marcus Brothers is very nice too)….I just prefer to really mix up the prints and colours for a better contrast. 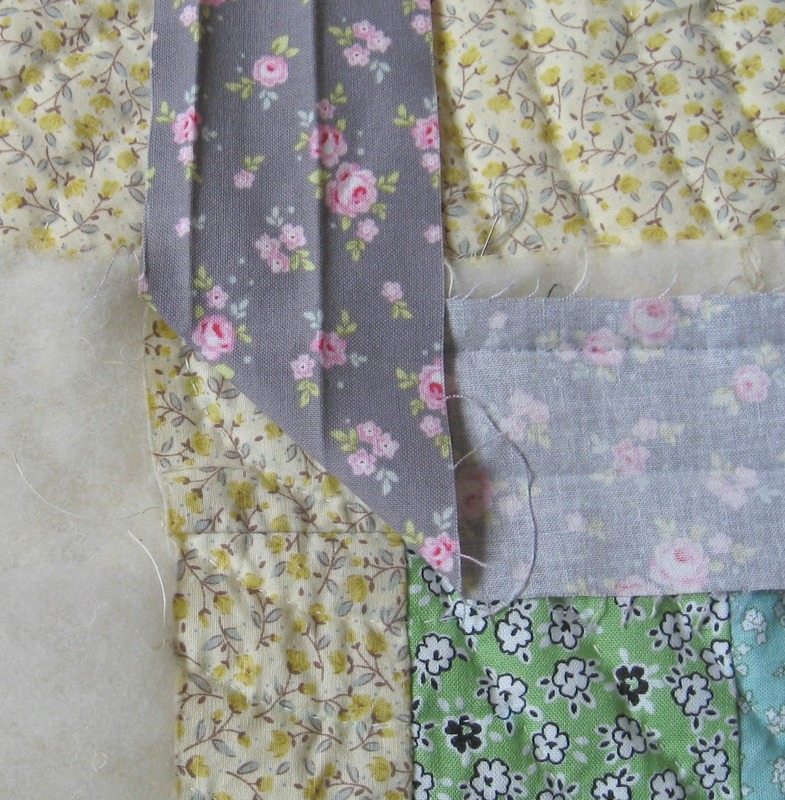 I also ordered prints in different colour combinations as I always think that seeing the same print but in a different colourway adds extra interest to the overall look of the patchwork. I made a note of the fabrics which were being used and pinned tiny swatches to a work board so I could keep track of what was being used where. Then the blocks were cut and I began to piece them together. 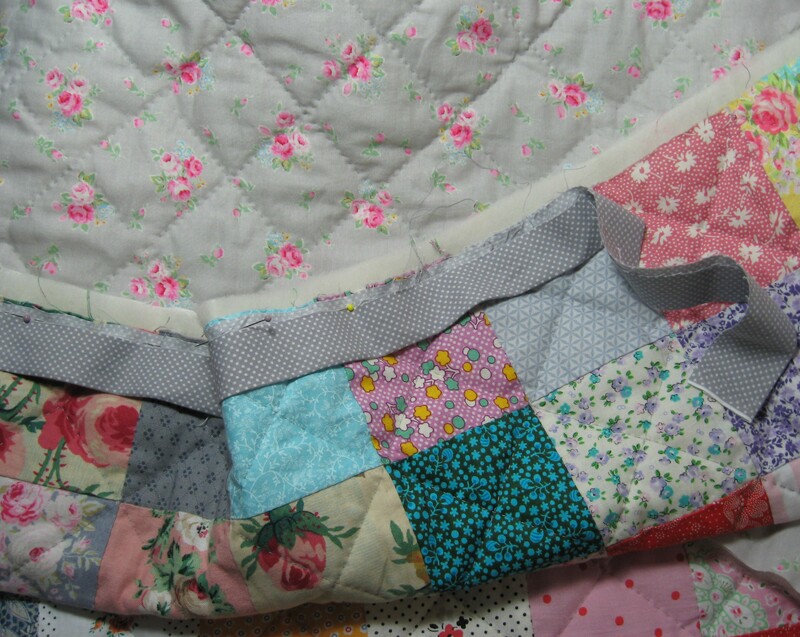 All the patchwork was sewn together by hand, it’s my preferred method of working as it means whatever I’m sewing is nice and portable so if it’s sunny I can move my work basket out of doors, and it’s quiet so I can listen to music. 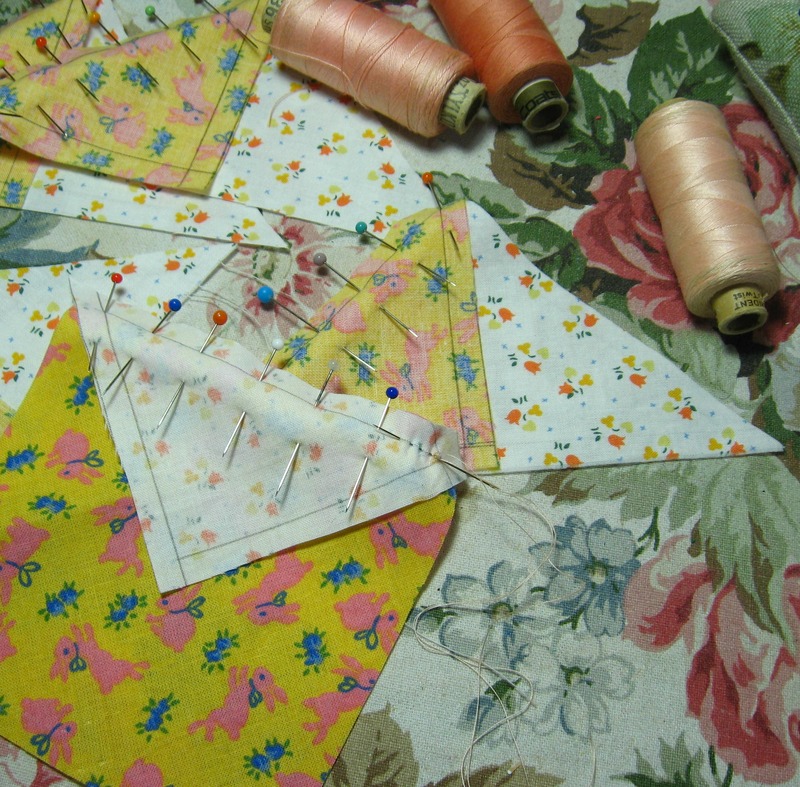 Once the stars for the first quilt were sewn I then set about pinning them together and joining them up to make the first patchwork top. 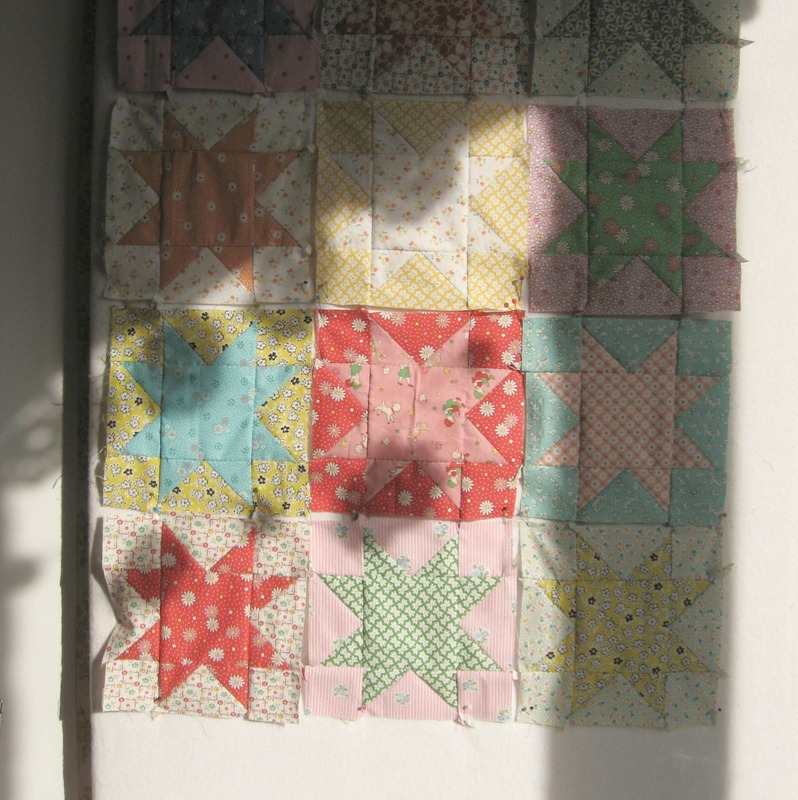 The clocks changing and the sunshiney weather made a big difference to the light in my work room, several times I was treated to beautiful shadows dappled across the patchwork while the small squares were pinned on to a design board. 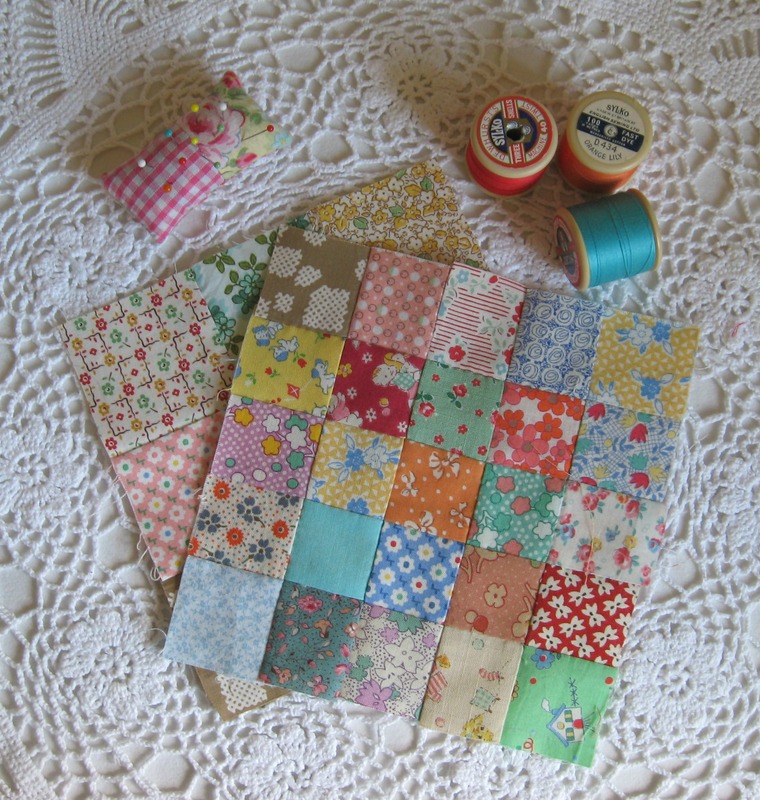 When the joined blocks are all finished it feels lovely….and I can begin to see the patchwork tops as quilts…I really think all the time spent playing with papers and painting them up to make the little paper patchworks paid off. 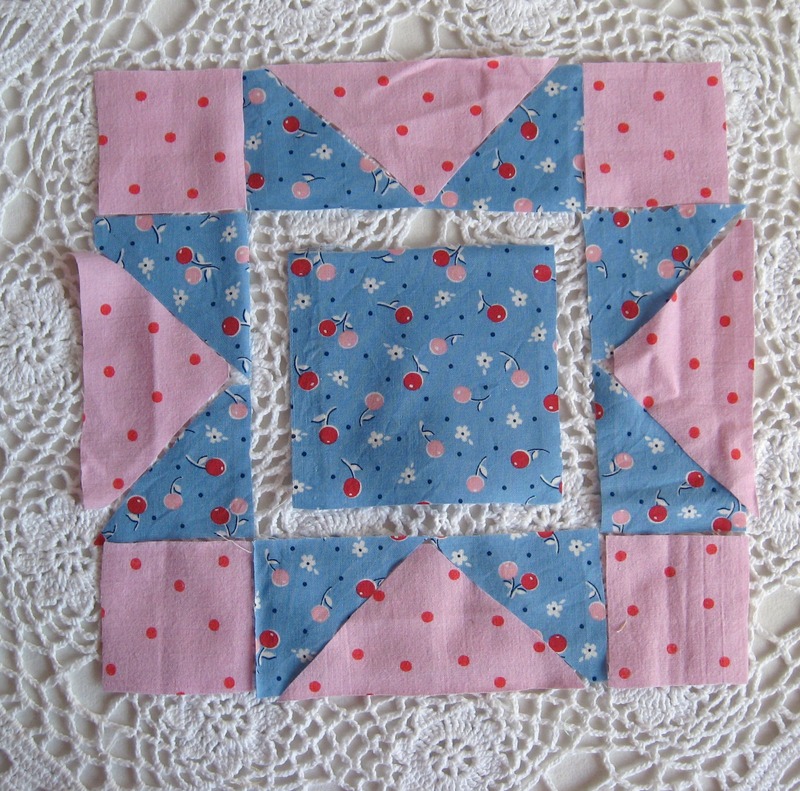 When I’ve explained to friends what I’ve been doing I could see them thinking “she’s off her rocker” but it was hard to imagine how the patchwork would look when you only use a solid colour…..the finished patchwork has come out just right, and captures for me…. sunny days, ice creams and lollies, day trips to the sea side…..an overwhelming feel of happiness and smiles. I’d bought just enough of the back fabric to be able to use it as a border for the front of both quilts, this was carefully cut (one of the only times I used a rotary cutter while making the quilts…the other time was when I was making the binding)…and then pinned and sewed around the tops and sides. 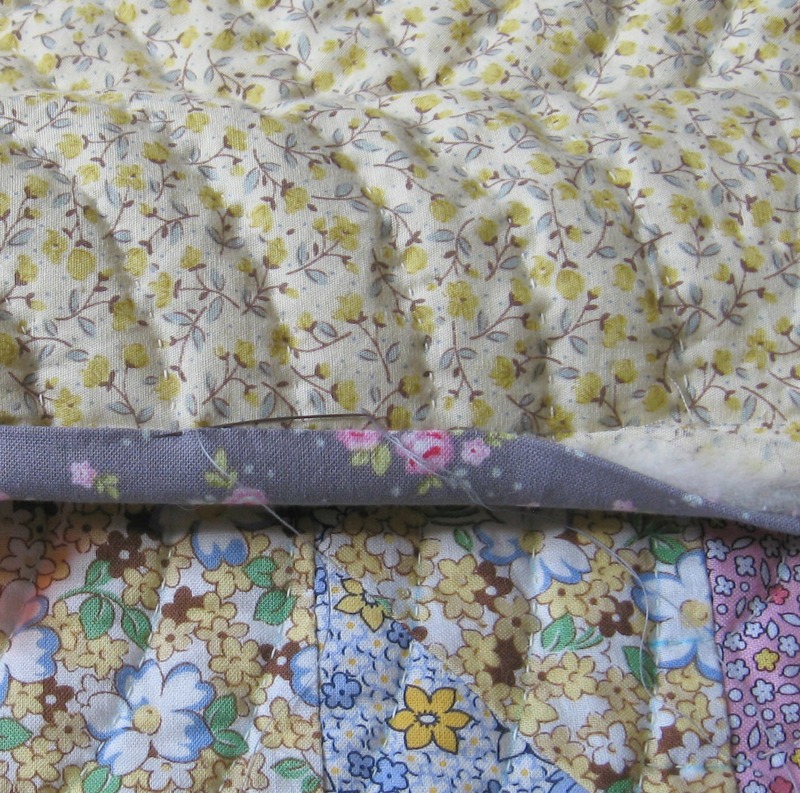 Once the binding is in place, it’s time to baste the quilt. It’s a bit like making a huge quilt sandwich but instead of using bread you’re using fabric with the wadding as a soft and puffy filling. I like to do this on our carpet and I also like to thread baste my quilts as I find this holds the layers together more securely. A quilt this size takes a few hours to baste securely, so it’s not too bad, though you might want to get up and have a shake about every 15 minutes or so as it’s a bit hard going on your knees and back. I also sew some spare fabric (old calico or American muslin or curtain lining) round the corner sides and edges where the quilt doesn’t really have a lot of room to fit in the hoop. 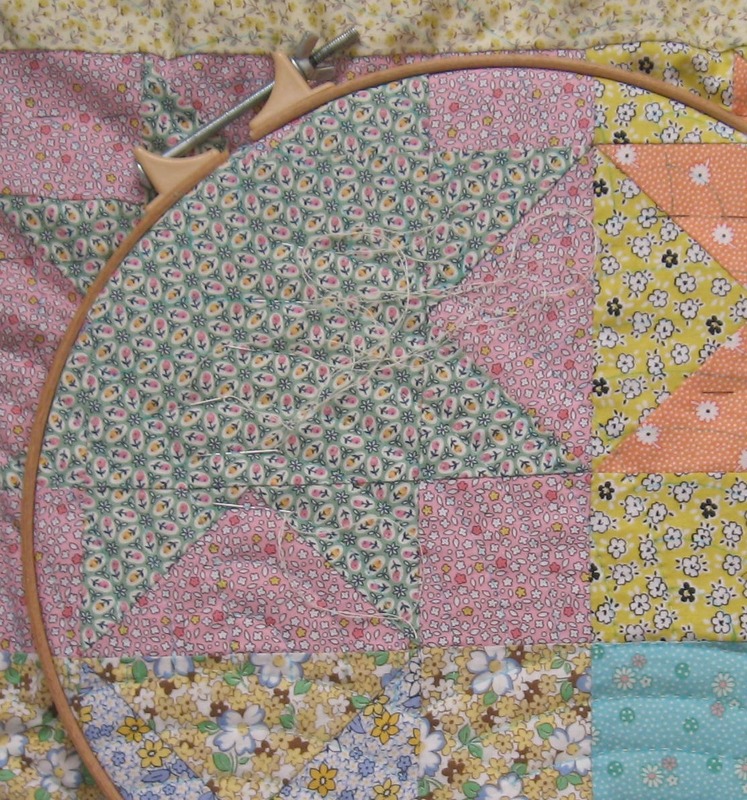 I find it much easier (and get a nicer quilting stitch too) if the section of my quilt I’m quilting is sitting in the middle of the hoop rather than right at the edge. 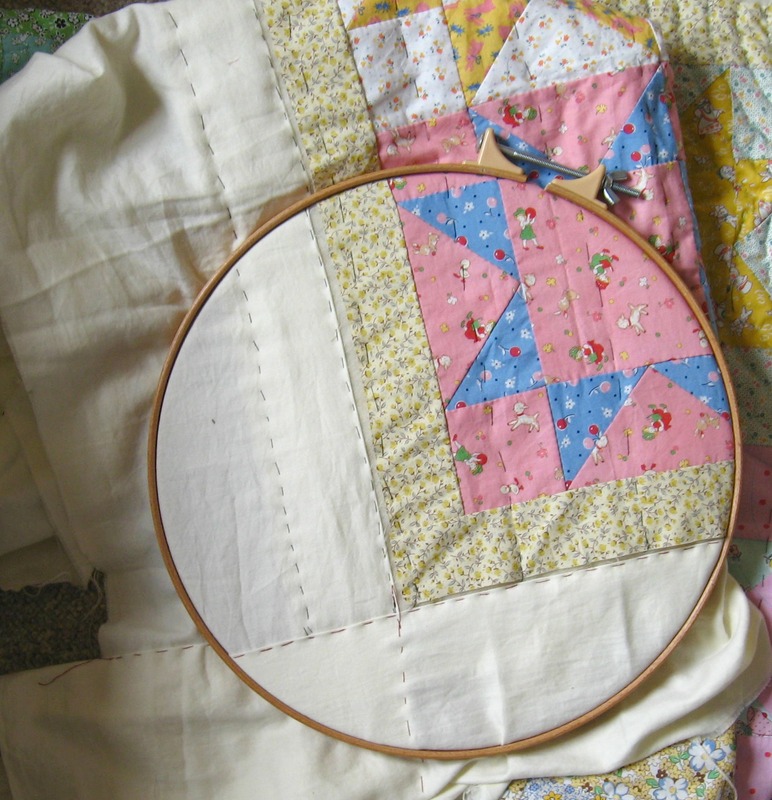 Sewing the extra fabric round means you have a bit more room to move your hoop about, and it makes sewing those stitches easier as the needle isn’t being forced in a cramped little space. 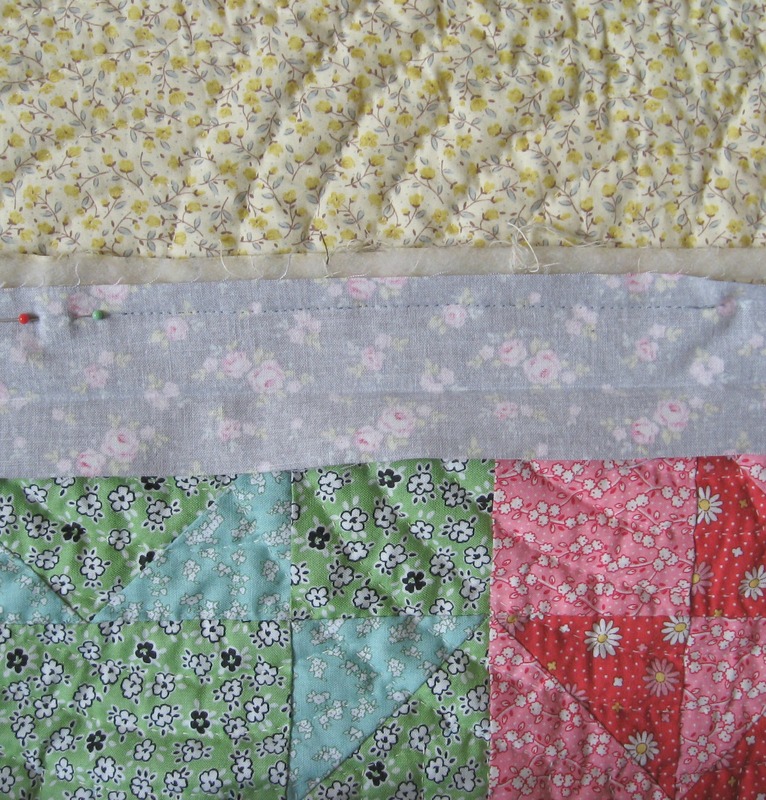 Once you’ve basted your fabric layers together, your patchwork top suddenly changes…you’re now holding a quilt, okay the basting stitches are rather big and unsightly, but it’s definitely quilty looking. 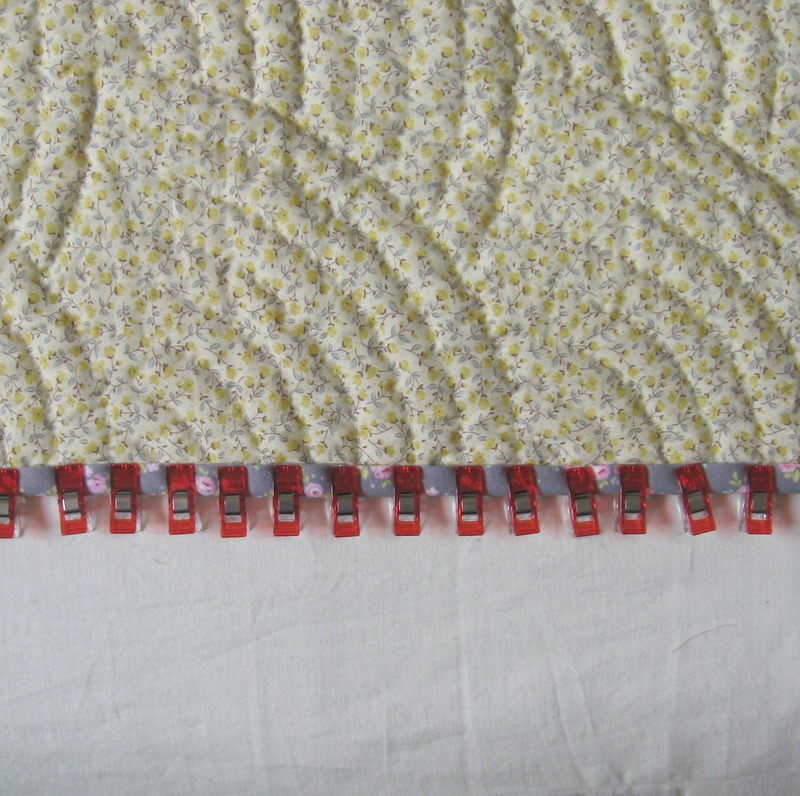 There are different ways to mark up your quilt, it depends a bit on the pattern you’re wanting to stitch. For these quilts I thought a baptist fan pattern would help soften the edges and seams of the fabrics and different blocks. 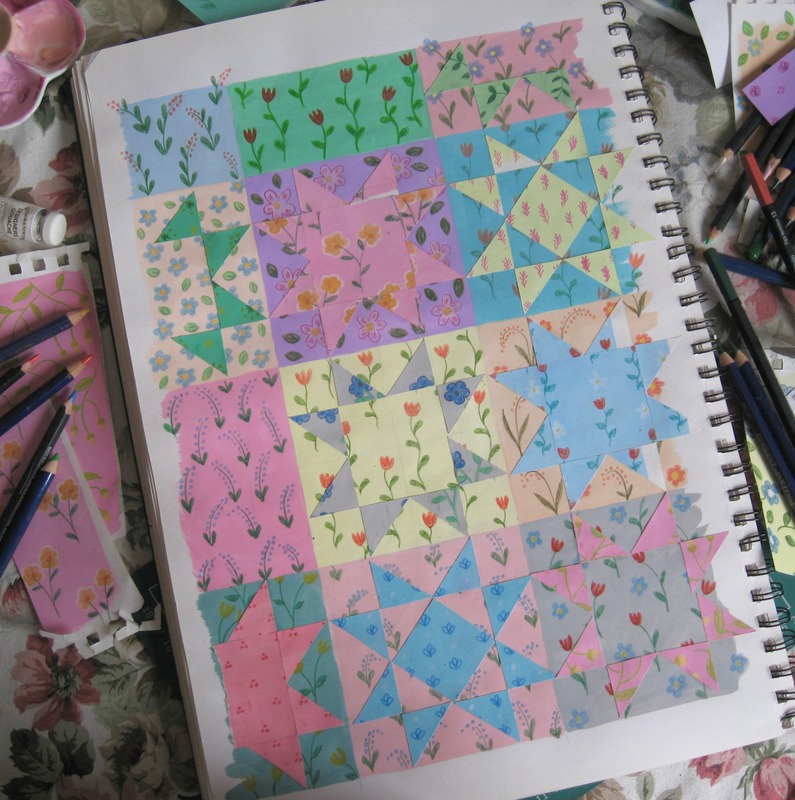 In the past I’ve used silver quilter’s pencils and ordinary hb pencils. I’ve used a water erasable blue pen for these quilts as I knew they were going to be quilted relatively quickly and the pen wouldn’t be on the fabric for a long time. When I’m quilting the baptist fan I like to thread up a load of quilting needles all at once and then i can just keep quilting rather than keep stopping and starting threading up needles…also I find working a curve with several needles on the go at any one time helps give the arc of the fan a nicer, more even curve. When the quilting was completed, I lightly spray the patchwork top with water to remove the blue pen, and allow them an hour or so to dry in the sunshine outside….I loved how translucent the patchwork looks, and the quilting is just ghostly and barely noticeable. Finishing a quilt always makes me sad….something that has been a big part of my life for the past some weeks (or more often years) is coming to an end. 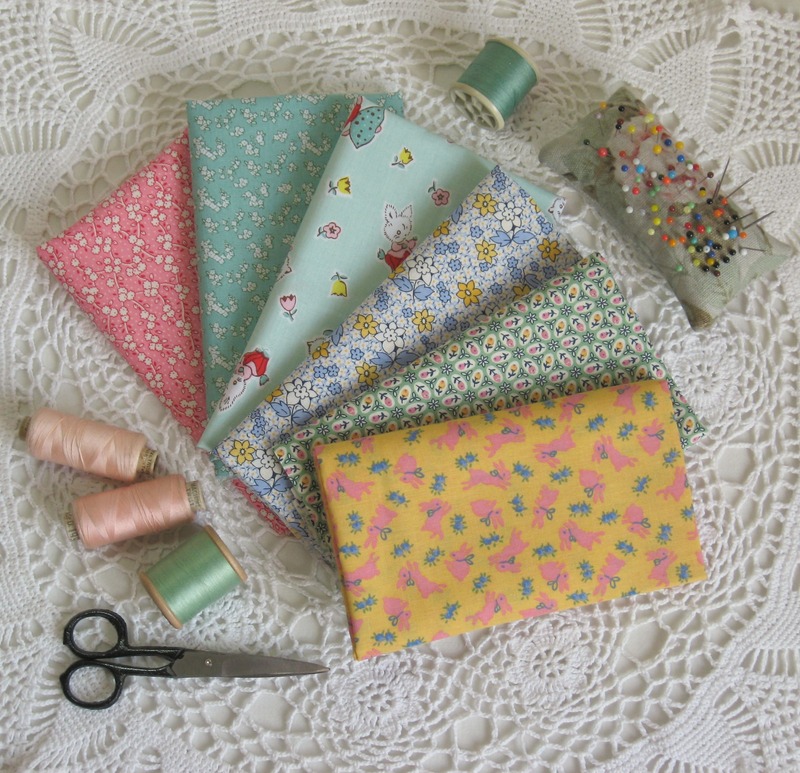 I prefer to make my own binding, it allows me to chose exactly which print or fabric I want, and not rely on what a shop stocks. 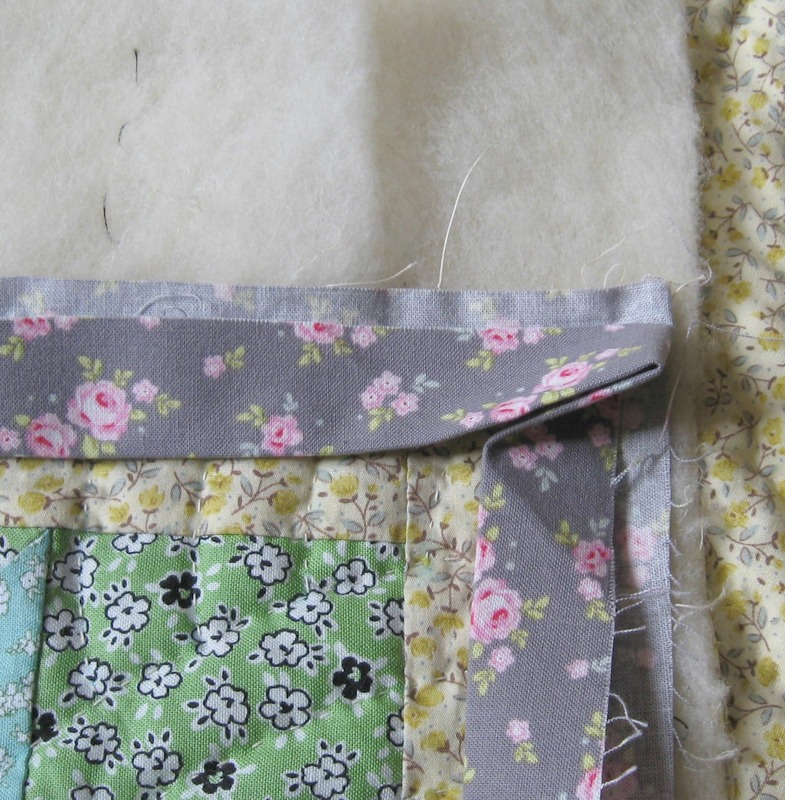 Sewing the binding to the front, carefully joining the edges, rolling the binding over and sewing it to the back and then mitring the corners…tiny stitches all by hand….. If you would like to commission one for yourself or someone precious then both quilt designs are now listed in my folksy shop or you can contact me directly if you would like something even more bespoke. 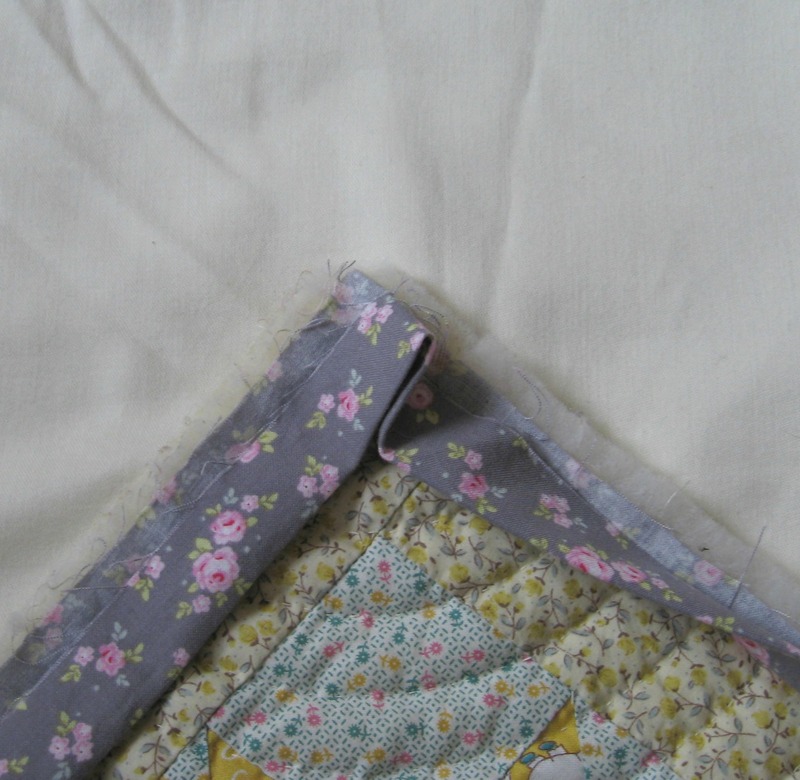 In the last of my posts about binding a quilt, I wanted to explain how to mitre the corner…..it seems really fiddly and okay, it is a bit, but a neatly mitred corner looks so nice that any fiddlesomeness is well worth the effort. It’s just important not to rush it. 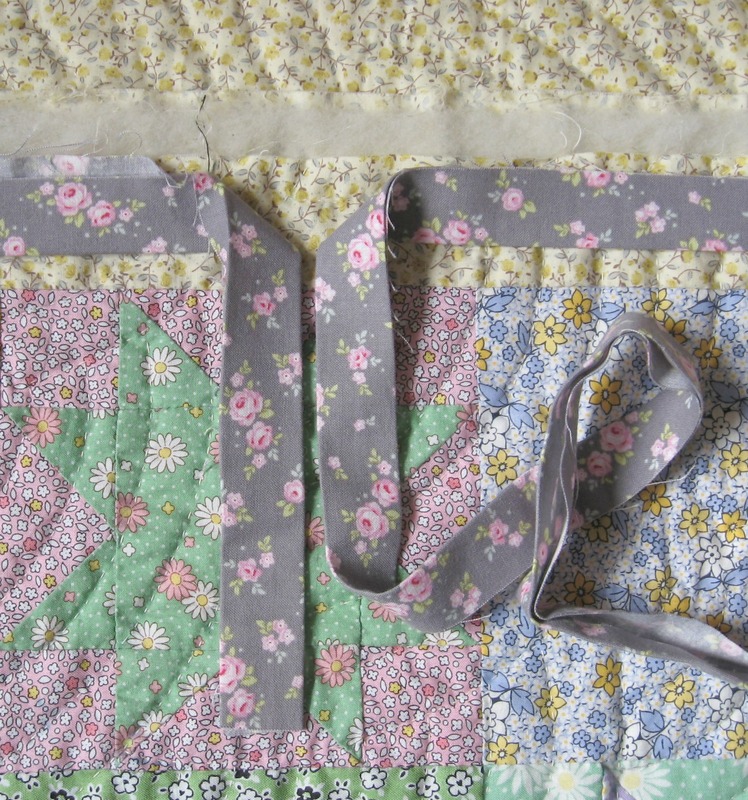 Once the binding has been sewn into place on the front, fold the binding over along the 1 inch pressed seam so you have a nice folded edge to sew along. The corner neatly folds up and sits on top of itself. 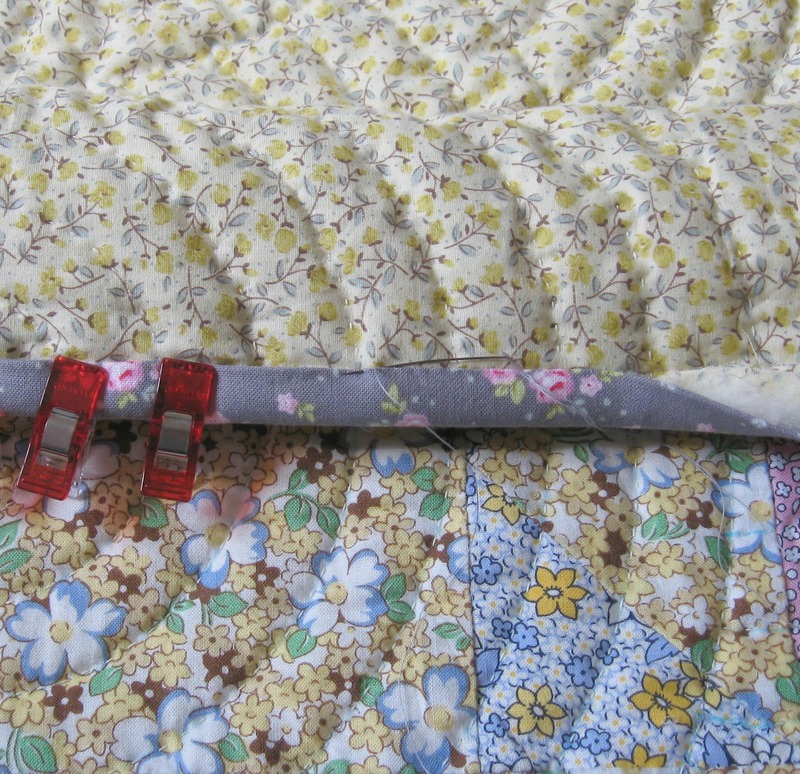 Turn the binding over, it pretty much rolls over the edge of the quilt, and will reveal the neatly folded corner that you made when sewing the binding to the front. Pin or clip the corner on the back. 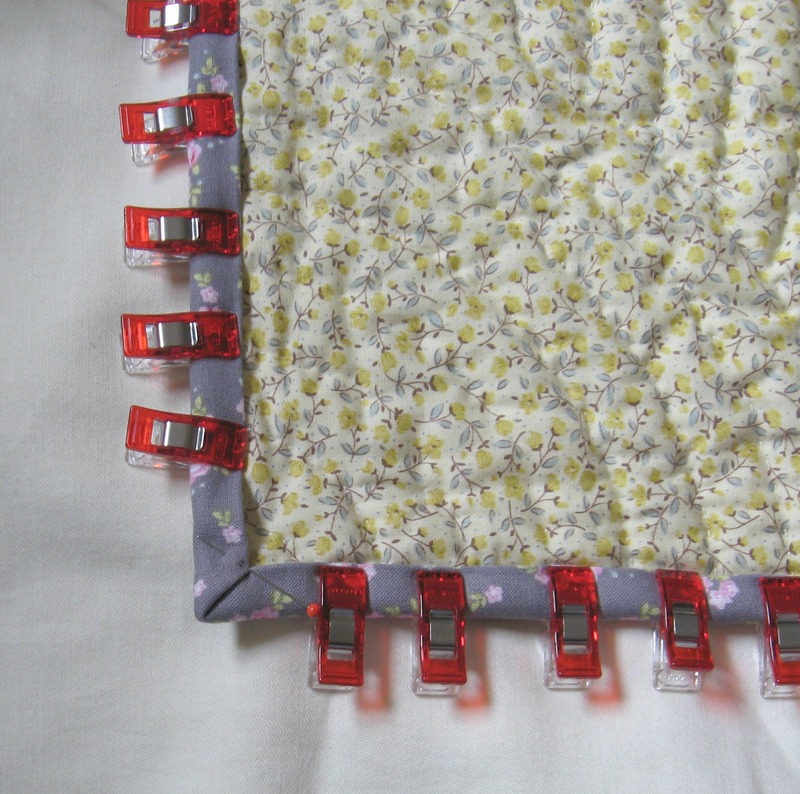 (I like to use Wonder Clips made by Clover) When you were sewing the binding to the front using a back stitch, a row of stitches formed on the back. 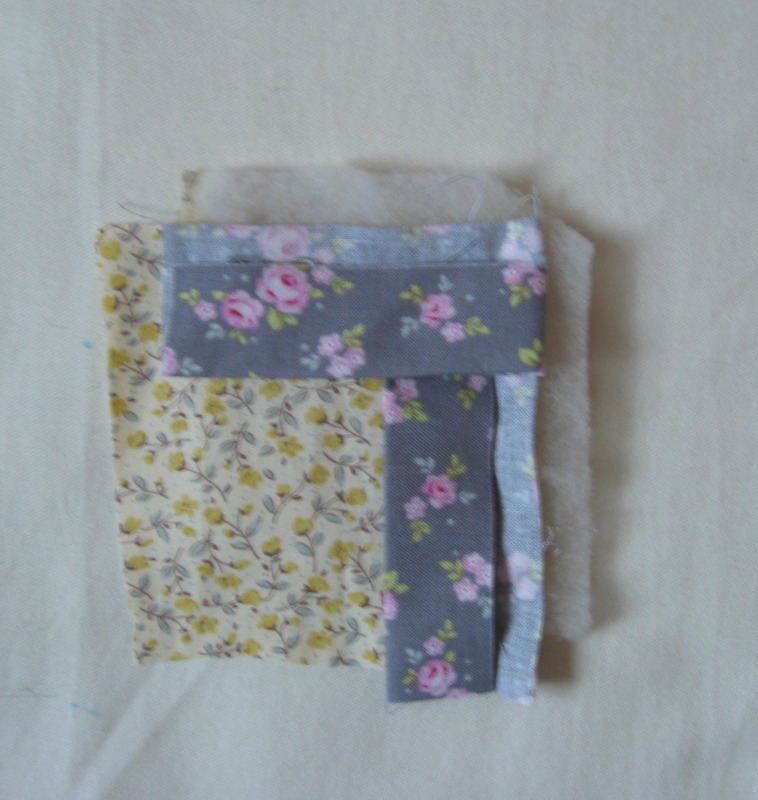 This is the guide for sewing the binding to the back. It’s important that you’ve clipped enough away from the corner so that the corners can be mitred neatly, so I like to check this by seeing if the corner pulls down comfortably enough to the corners of the sewing guide (where the two lines of back stitches meet). Sometimes I have to clip a little bit of wadding away if it is still a bit bulky. 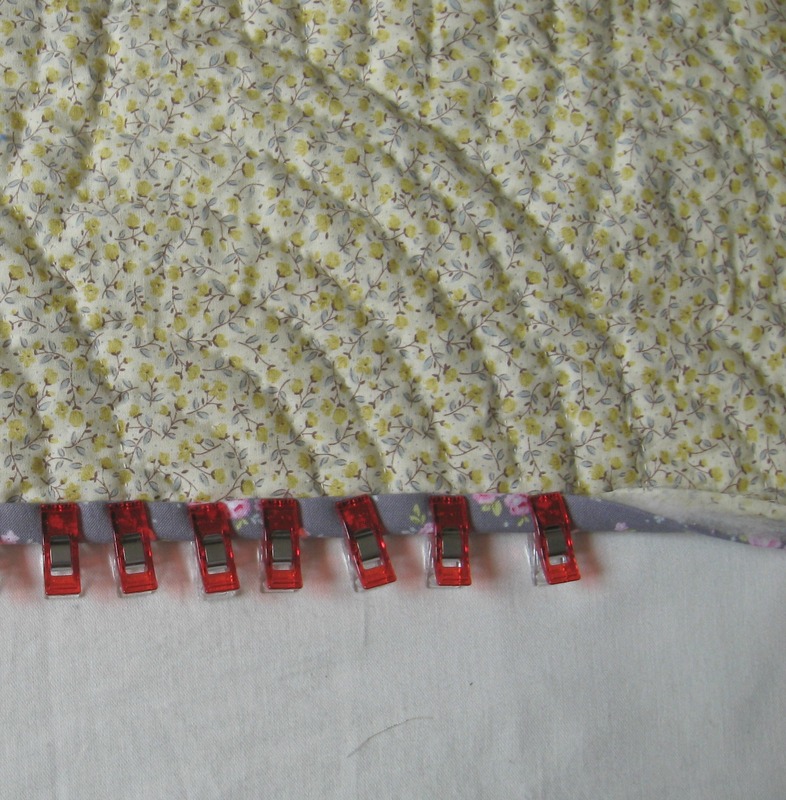 Now clip or pin the binding over the edge of the quilt into position. You can remove the corner clip or pin at this stage as it’s no longer really required. 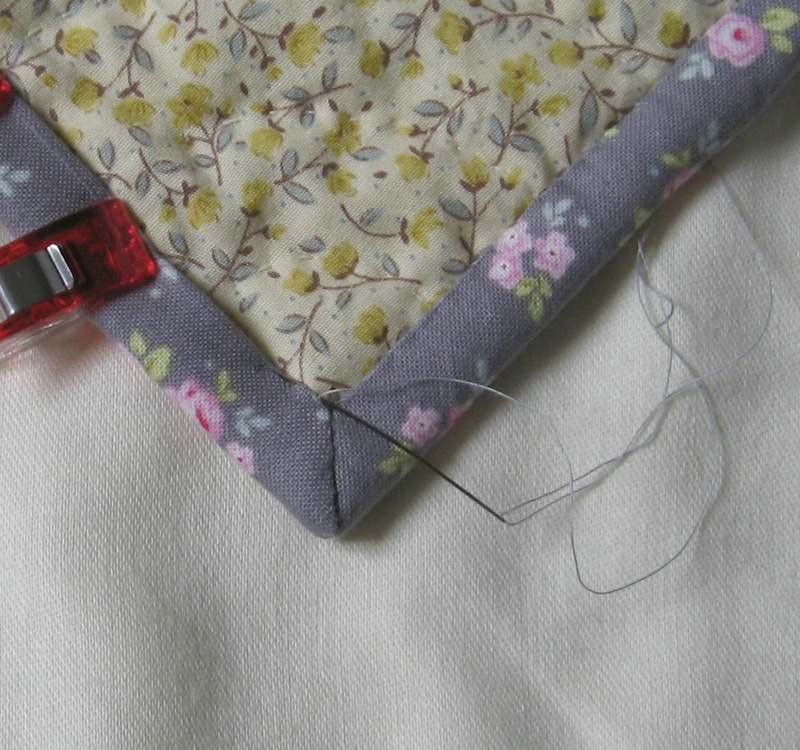 Using a slip stitch (in some books it is called a whip stitch) sew along the folded edge of the binding, securing it to the back of the quilt just above the sewn guide line. Sew the binding in place along into the corner. With the needle just tucked out of the way, bring the next side of the binding over and check that it forms a neat edge. You may need to very slightly tuck the diagonal edge underneath with the point. Once the seam has been tucked under and the binding edges meet exactly and form a neat diagonal, pin the top binding down into position. 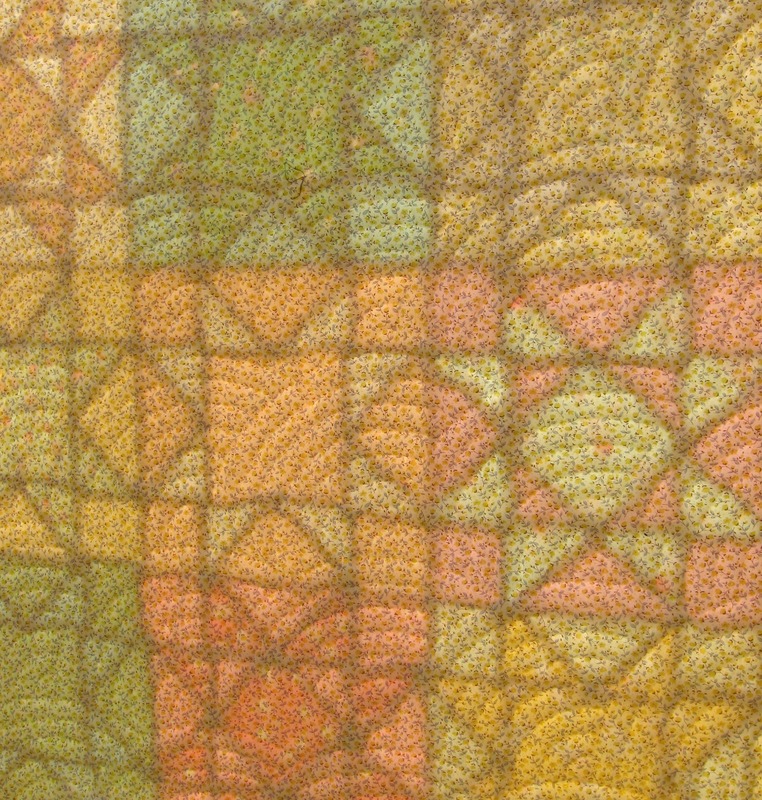 Turn the quilt over to check that it looks neat from the front. 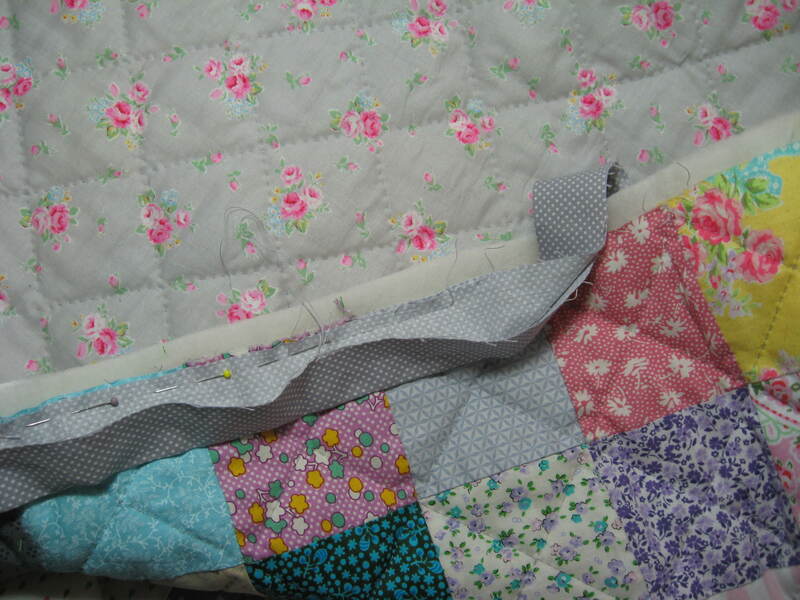 Sometimes the corner is a bit lumpy, you may need to unpick it and re-sew to neaten it. 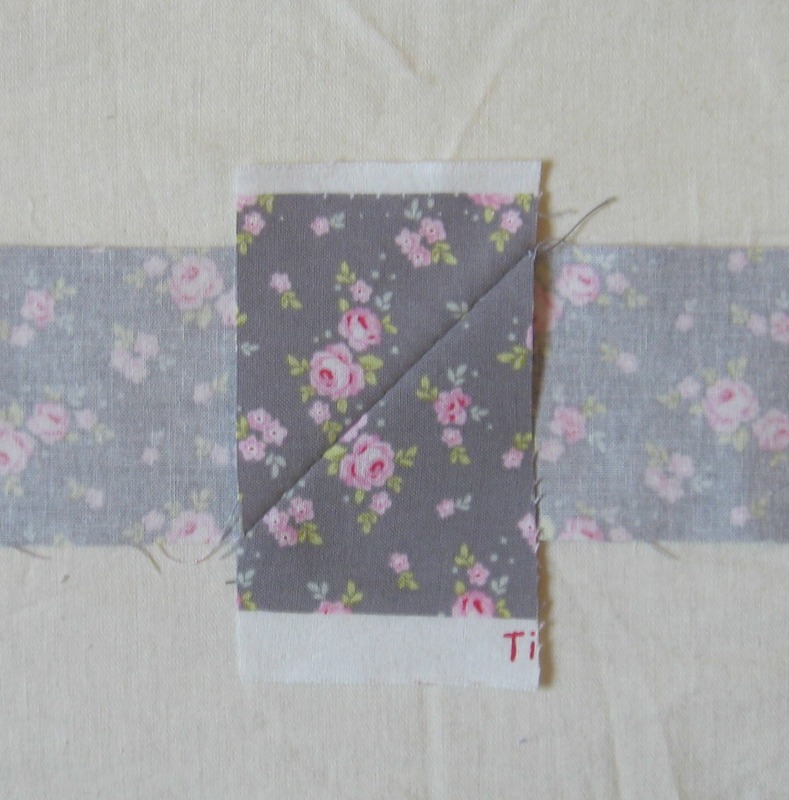 This can be caused if enough care wasn’t taken when the binding was sewn onto the front. Bring the threaded needle out at the bottom of the folded seam. I like to use Clover Black Gold Applique needles for sewing the binding as I find they’re really sharp and pointy, and are excellent for really fine stitches. Carefully slip stitch the folded corner closed. I generally find that tiny stitches make for a neater finish. When you get to the top, make an extra slip stitch to keep the fold secure, before moving your needle slightly and then slip stitching the next binding edge into place. And that is your mitred corner finished. Once all the corners have been sewn, I turn the quilt over and then hand sew each of the front corner folds down using tiny slip stitches. I do this last in case any of them need un-picking to reshape in case they’ve come out a bit on the lumpy side. 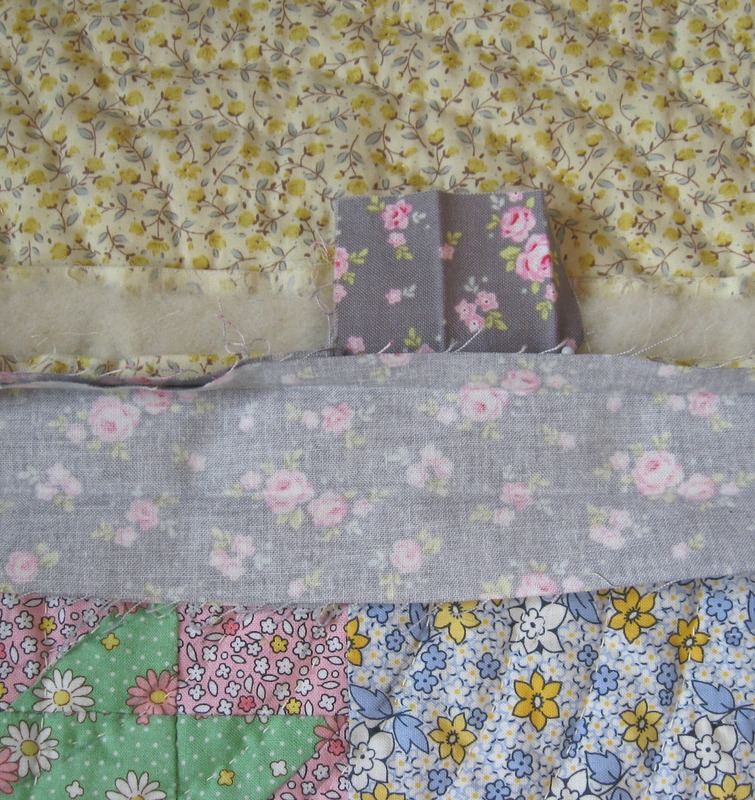 I hope these posts have shown how easy it is to make your own binding and how to bind a quilt with mitred corners. At some point I do intend to cover other binding methods that you may not be familiar with. 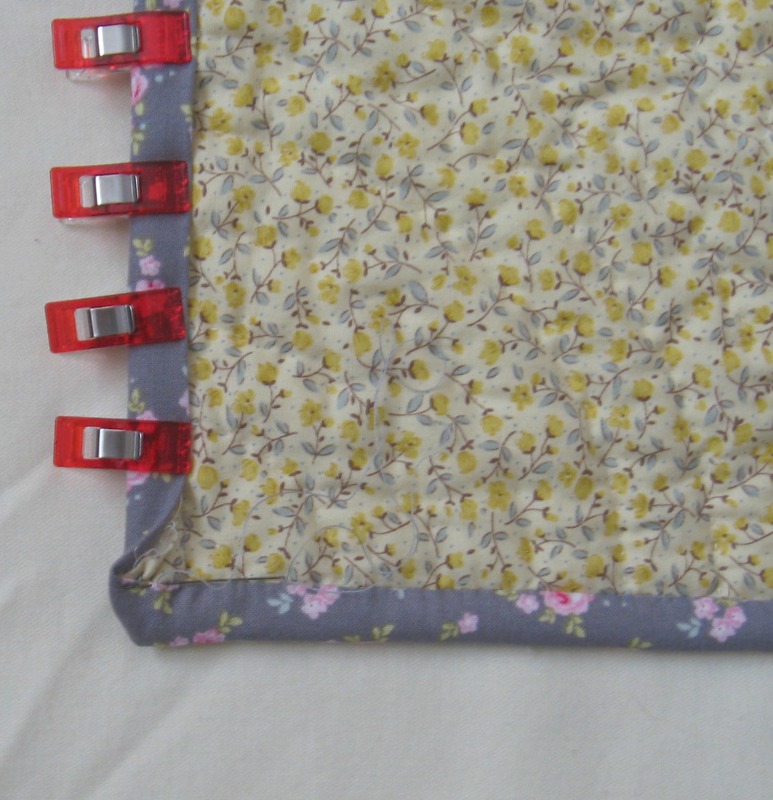 Sewing the binding to your quilt part two …. 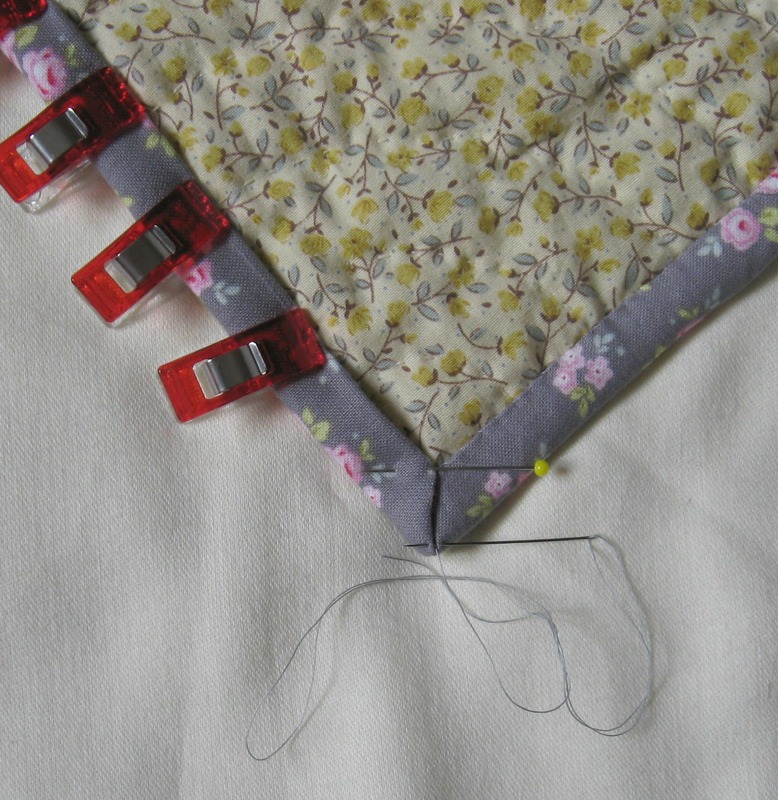 Once you’ve sewn the binding in place around the front of your quilt, it’s then time to sew it into position on the back. 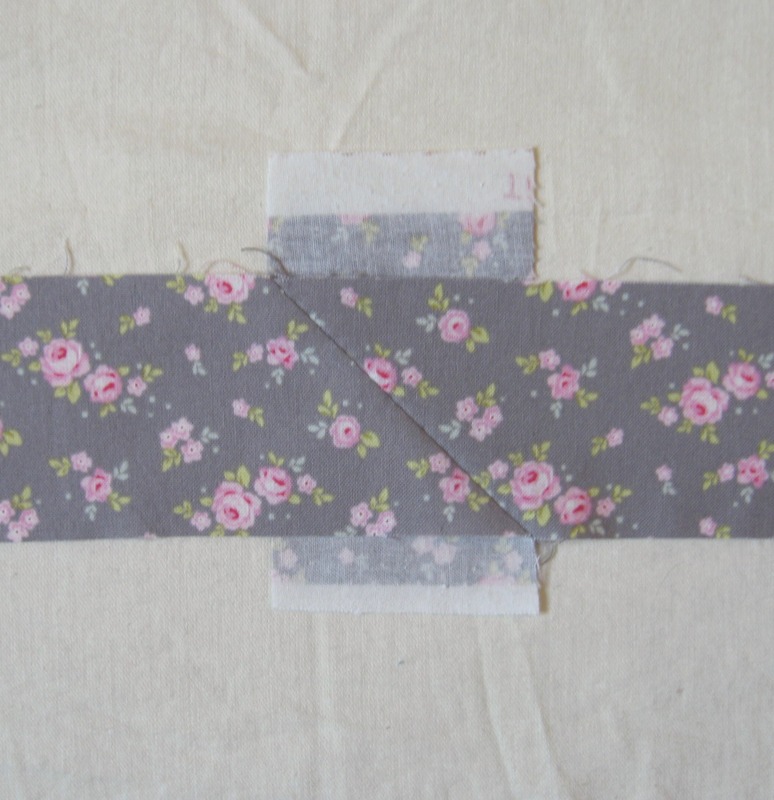 Begin by trimming both the wadding and backing fabric to between 1/4 and 1/2 an inch over the raw edge of the binding. 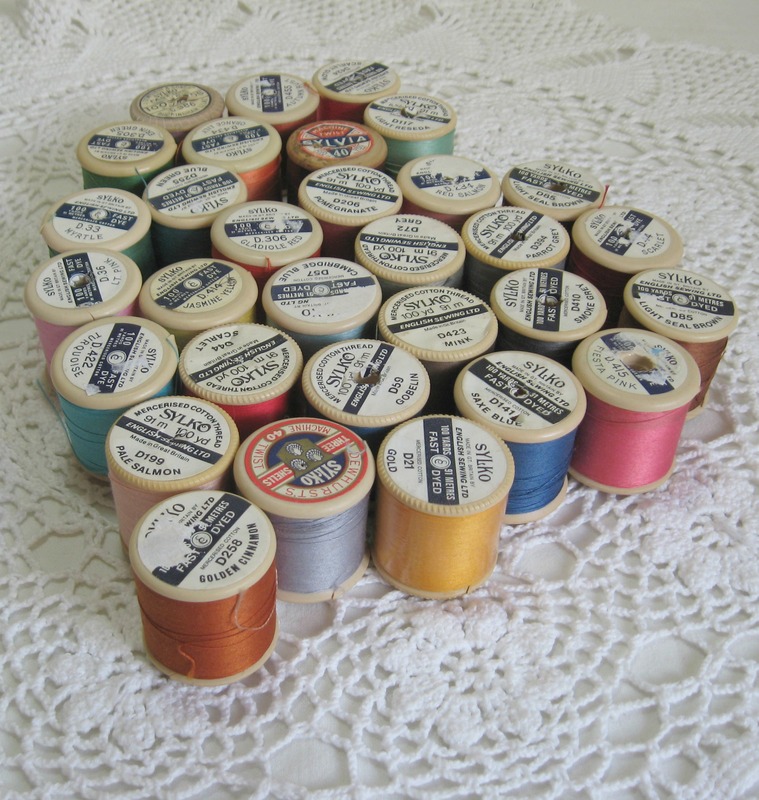 It depends a lot on the type of wadding you are using and the sort of binding you are sewing. 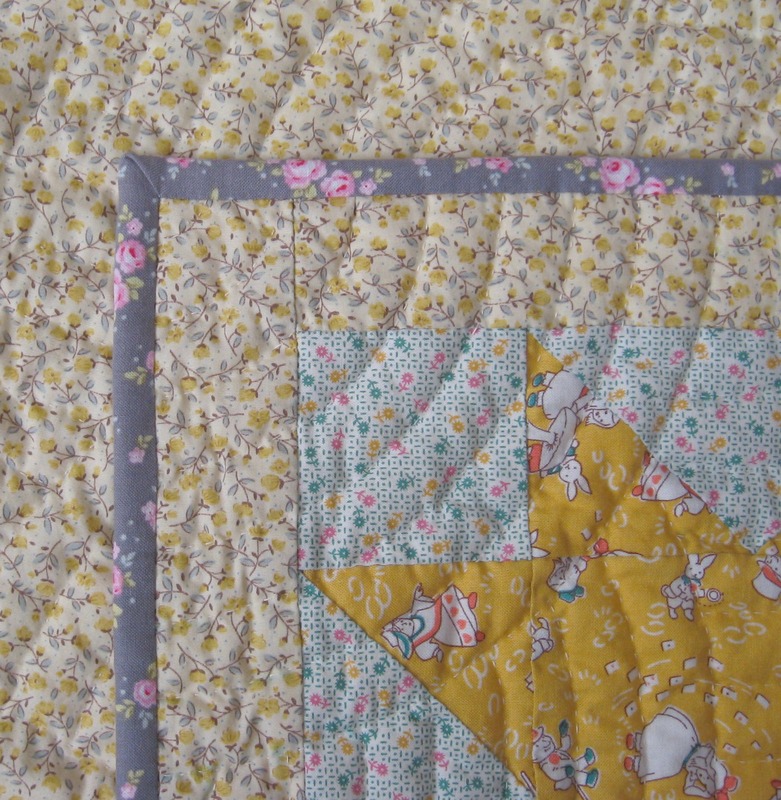 For this quilt I’m using a double binding and the wadding or batting is pure wool, so I’ve trimmed to 5/8 of an inch (or what I like to think of as a generous 1/4 inch). You can check that you’ve cut enough wadding away by turning over the binding. you don’t want to be able to see the wadding or backing fabric. 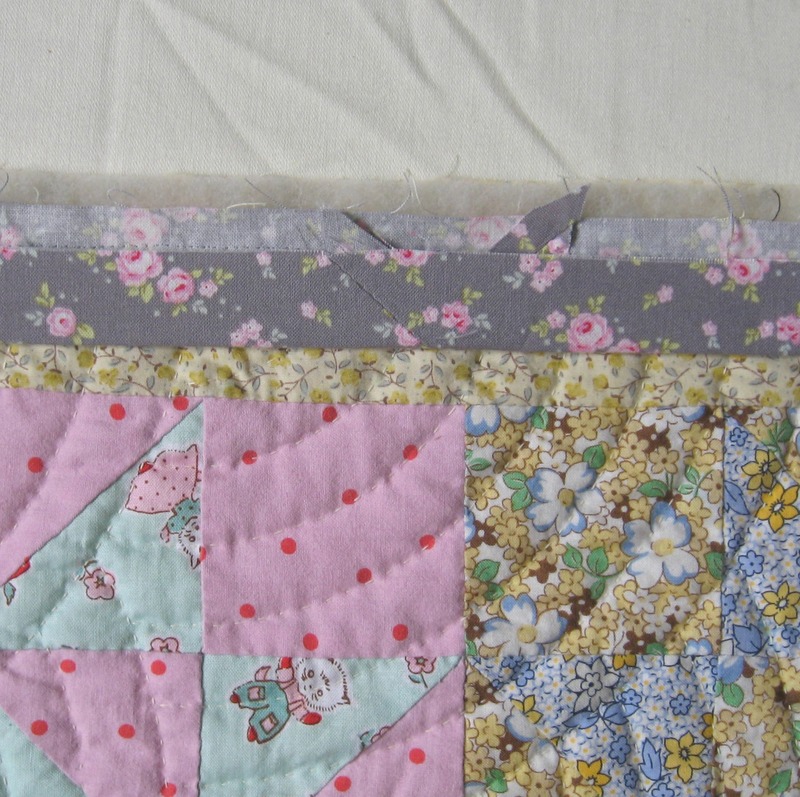 It’s important not to cut too much away though, the edges of a quilt get handled a lot so the bound edge needs enough wadding inside it to keep it nice and plump. 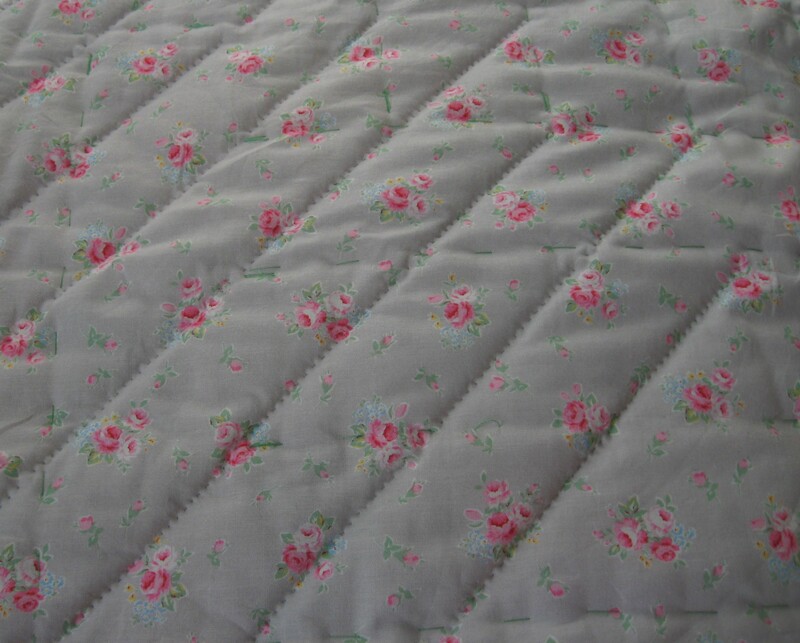 You can also turn the quilt over to check the binding just peeps over the back. 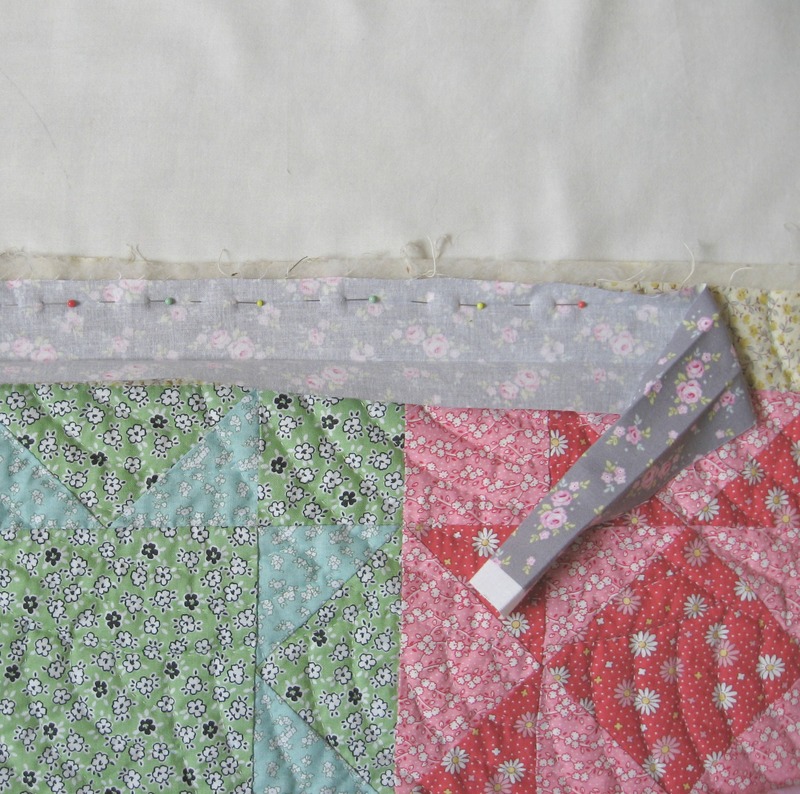 As the binding is sewn into place and rolls over the edge of the quilt, the wadding folds in on itself, doubling up and forming a strong edge. The tiny back stitches show you the guide line you will be wanting to bring your binding edge over to. Starting somewhere along the bottom edge, preferably just off from the middle, bring the folded edge of the binding over to the guide line of your back stitching. Pin or secure with a “wonder clip” into place. Repeat until you have secured about a foot of the binding into place. When I used to use pins I’d position them pretty close together, the clips have a bit more strength so I place them about 3/4 of an inch apart. Normally I never make a knot when I am hand sewing, instead preferring to make a couple of stitches on top of each other to secure the start and finish of what I’m sewing……however, when I’m sewing the back of the binding into place then I do make a small knot in the end of the thread, before slip stitching (or whip stitching) the binding into place. Some books call this a slip stitch, others a whipped stitch. The needle only goes through a small amount of the backing fabric (not all the way through to the other side) and then through a few threads of the binding fabric. The stitches are worked along at a slight angle and it helps if your thread isn’t cut longer than 12 inches. (too long and it tangles). You’ll get the best results if you use a fine applique needle or sharp for this. Clover make two excellent needles for this type of sewing, one is called Clover Gold Eye Applique Needles (at the time of writing they are about £2.50 for 15). The other ones they make are called Clover Black Gold Applique Needles…okay they are pricey…you may need to sit down at this point…..the last ones I bought cost about £4.50 for 6….. so yeah they aren’t cheap, but ohh, they are sharp, as skinny as a moonbeam and as strong as an ox. If you’re worried you’re making your stitches too deep then you can just turn your work over and you’ll be able to see if any offending stitches are coming through. 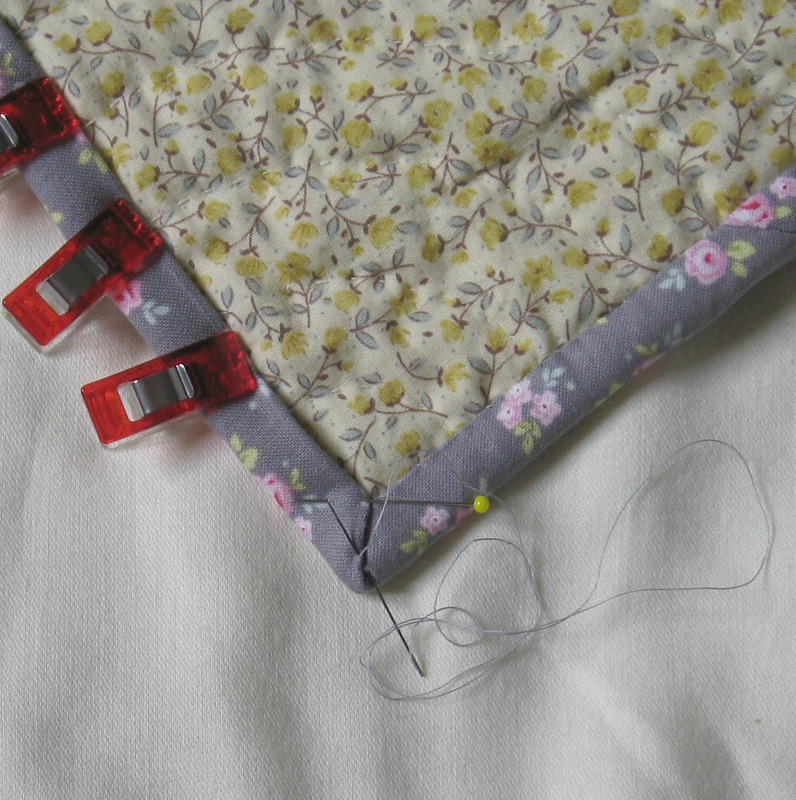 If they are then you can easily un-pick them and re-sew the binding in place. Rushing this stage is so tempting because your quilt is nearly finished but you’ll get a much better result if you just sew slow and sew steady. Also, make sure you’re sitting with a good light source so you can really see your sewing. I really do love these little clips. They are such a great colour so are nice and cheery to use, but they also are very good for holding the binding in position. I’m lucky enough to have a big box of 50, but I’ve seen them in smaller boxes at my local quilting shop. They are a bit fiddly to being with but as someone who still after many years of sewing still manages to prick herself all the time, they are very forgiving on sore fingers. 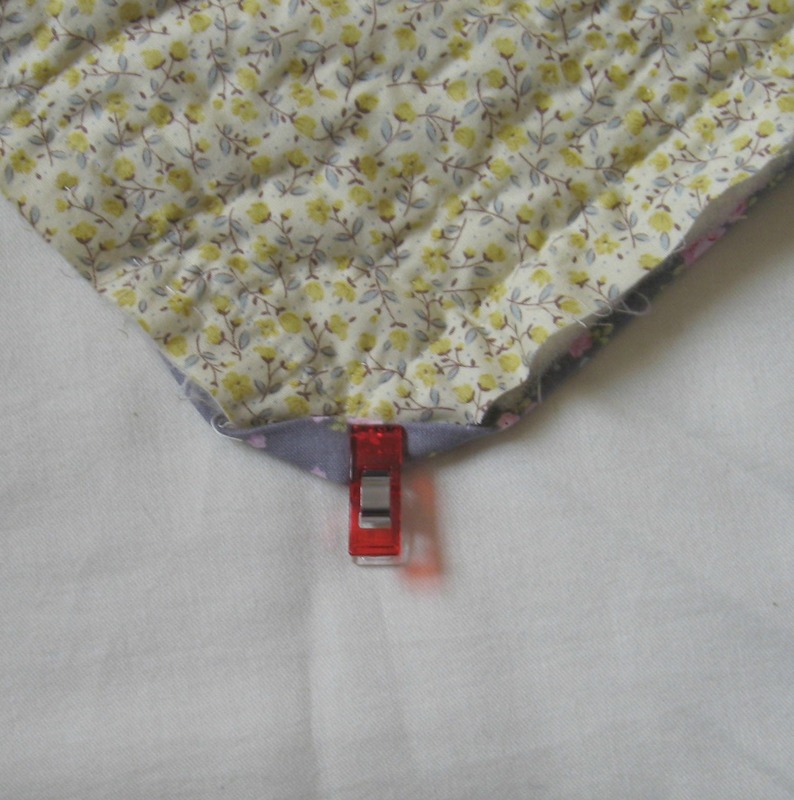 Once you’ve sewn the binding around the front of your quilt, you’ll need to join the two ends together before being able to sew the binding on the back. It’s a little bit more fiddly than when you joined the binding strips together but only a little bit. Draw a 2 1/4 inch square with a diagonal line running through it on the wrong side of the left hand tail. I tuck a cutting mat or a sketchbook underneath the fabric so I’ve got a firm surface to draw on….just peeping at the top of the picture is the little 4 1/2 inch gridded square I use for small patchwork measurements, and it came in very handy drawing the square. Because it’s see-through you can check your square is nice and level against that pressed top seam which you’ve been using to sew along. Checking that you are folding exactly along the drawn line, carefully fold the binding over and with your thumb nail press along the fold and then pin the fold together so it doesn’t wiggle about. With the left hand side of binding underneath, carefully lay the binding from the right hand side over it, just smooth it out so it’s nice and flat. Carefully remove the pins keeping the fold in place and now put them along the top edge of the binding and one through the bottom edge. You need to keep the two pieces of binding in place. 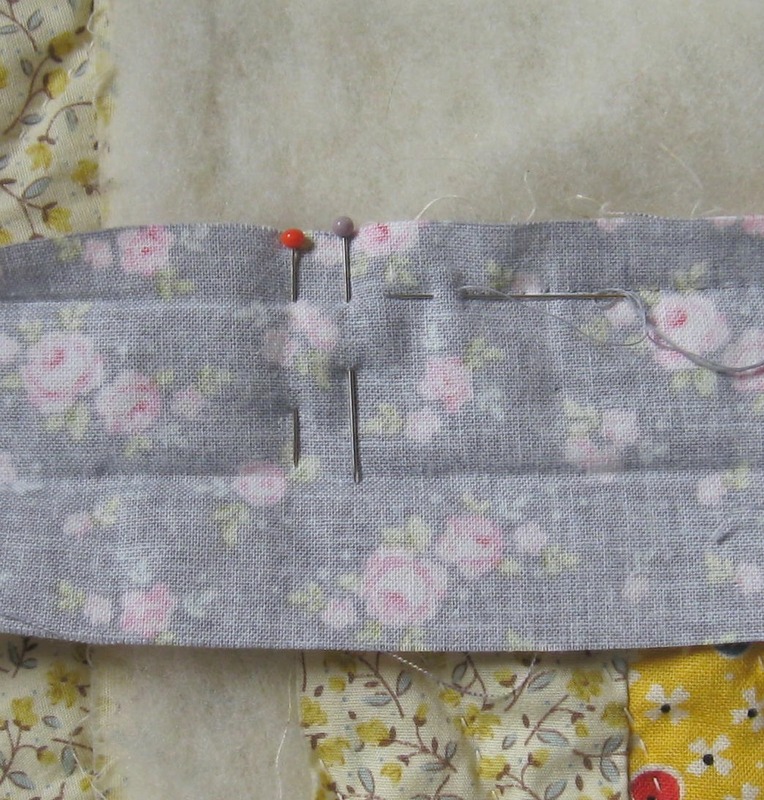 Now this is the fiddliest bit (if I haven’t already got one I make a pot or cup of tea)…..when I showed you how to start sewing the binding in place I said to leave a nice sized gap about 10 inches wide. This gap means you can turn the binding in on itself and also position your hand in to move the fabric so you can see what you are doing. Slide your left hand under the binding to support the two pieces of binding. The pins in the binding are holding 3 layers of binding together and you need to un-slide the pins from the bottom layer and secure them to just the folded over flap. 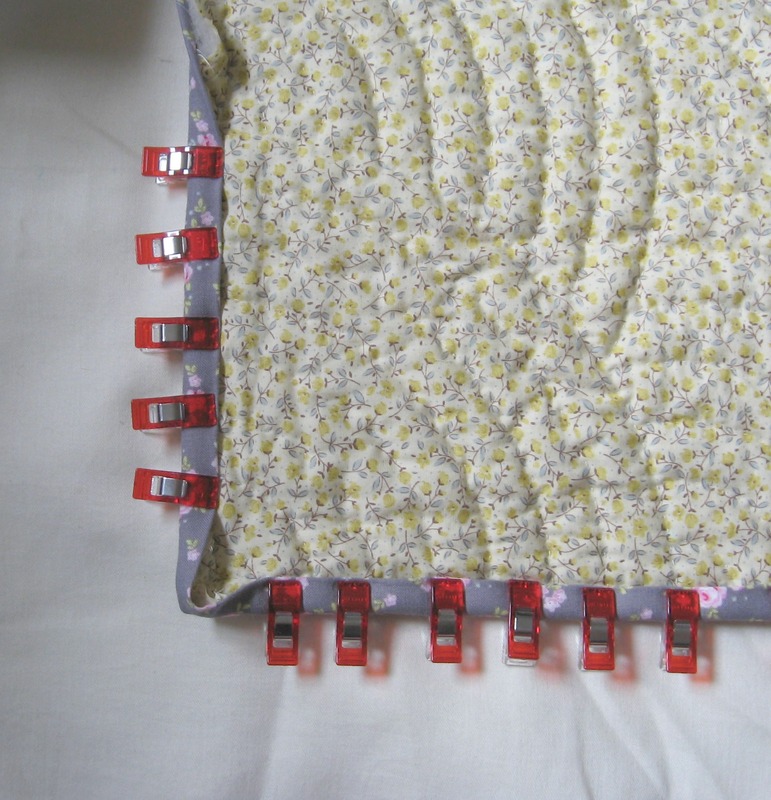 Carefully so you don’t disturb the position of the binding, remove the top pin very slightly so it un-pins from the bottom layer of binding, and then just slide it back through so only the top layer and the flap are pinned together. I find putting the pin through the folded 1/4 inch seam helps a lot. Now do the same for the second pin, I find it’s easiest to remove this one and then to re-pin it along the right hand side so it’s at a right angle to the top pin. 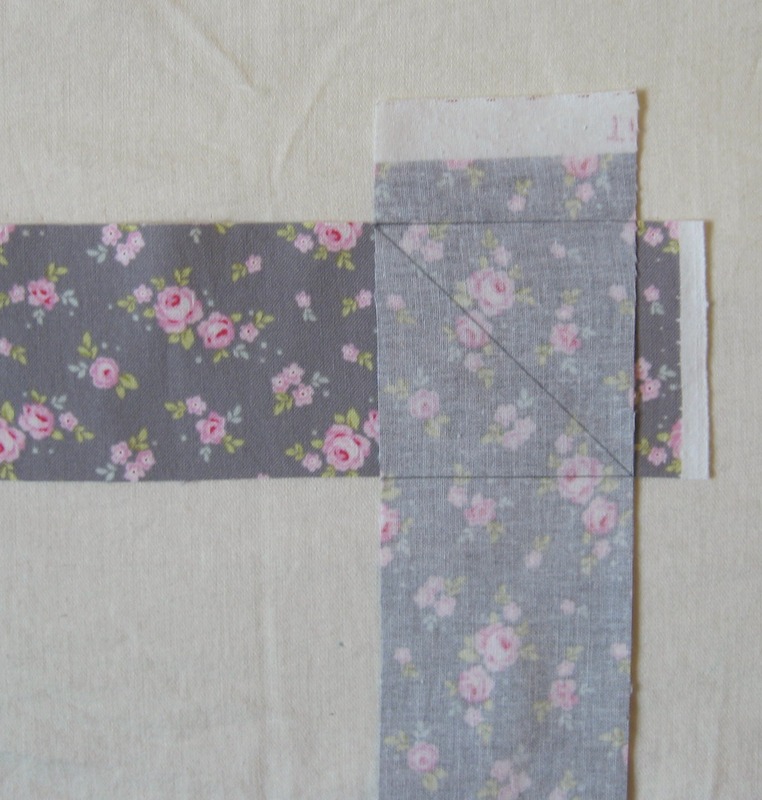 Now you should be able to turn the pinned flap of fabric over, and you’ll see your drawn diagonal line. Pin this carefully into place and remove the two pins from the other side. Turn your work back and just check that it’s all laying flat and that the two pieces of binding are in the right position. 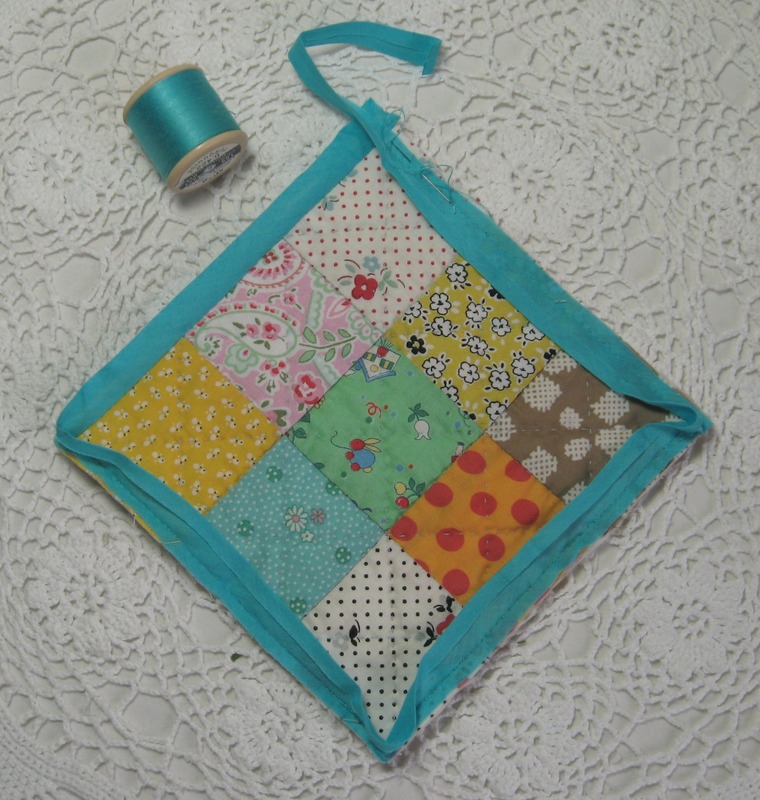 Turn the folded over flap back and sew along the pinned drawn diagonal line (starting and finishing with a couple of over stitches rather than a knot.) 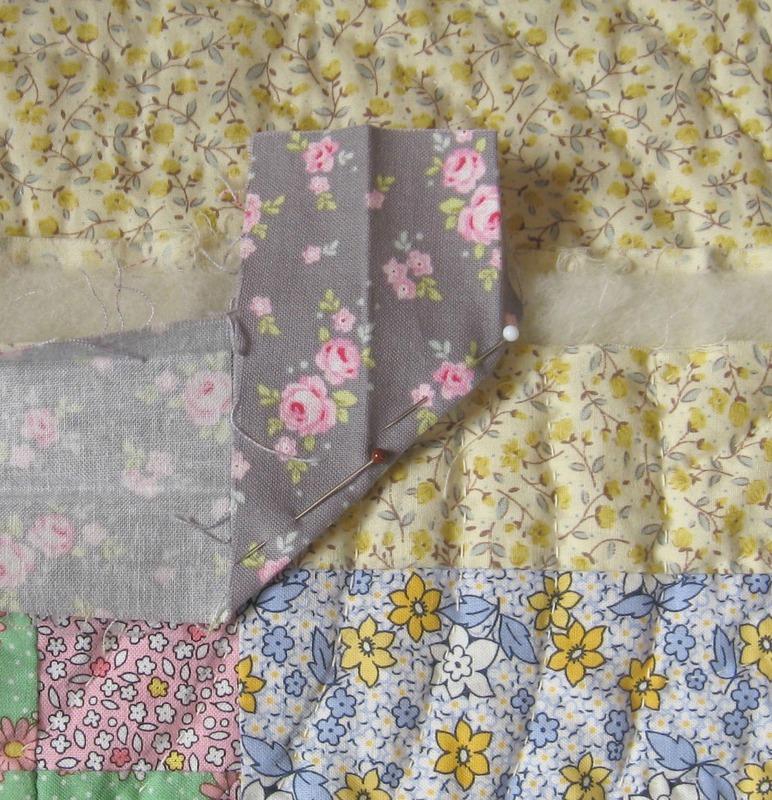 I always end up at this stage with the quilt in my lap all higgledy piggledy while I’m sewing this piece into place. Open up the seam and finger press it open (again, putting a small cutting mat or sketchbook under the binding helps to get a nice firm press)….sometimes the wider pressed seam doesn’t quite match up (I think mine was out something like a 1/16 th of an inch), but as it’s just a tiny fraction, that really won’t show once the binding has all been sewn into place. Trim the sides of the flap so you have a neat edge (1/4 of an inch or 5/8) and then continue to sew along the rest of the pressed 1/4 inch seam. 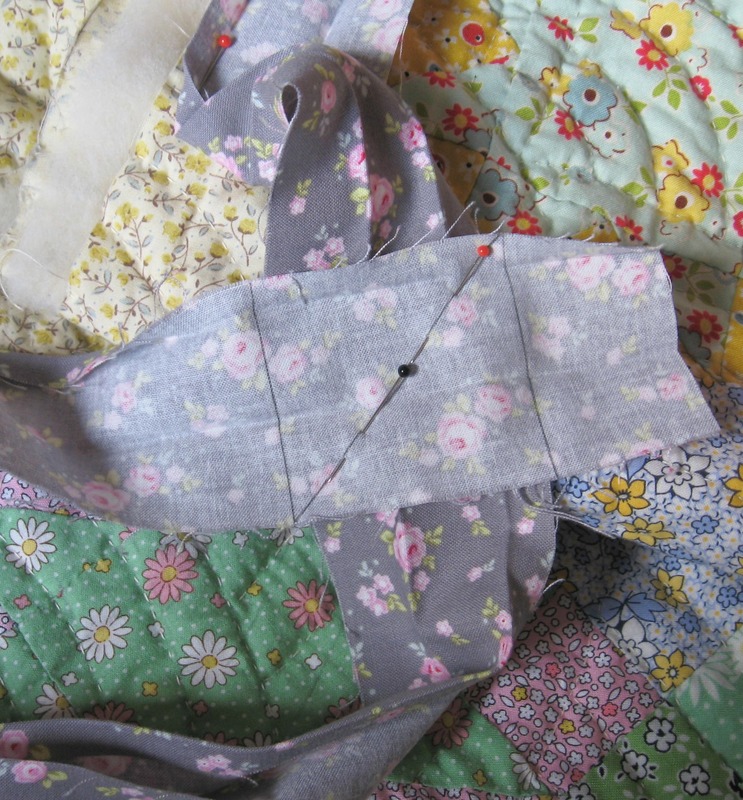 When you come to the open flaps, just sew them down wide open along the pressed seam. Sewing the flaps open makes for a less bulky edge when you turn the binding over. 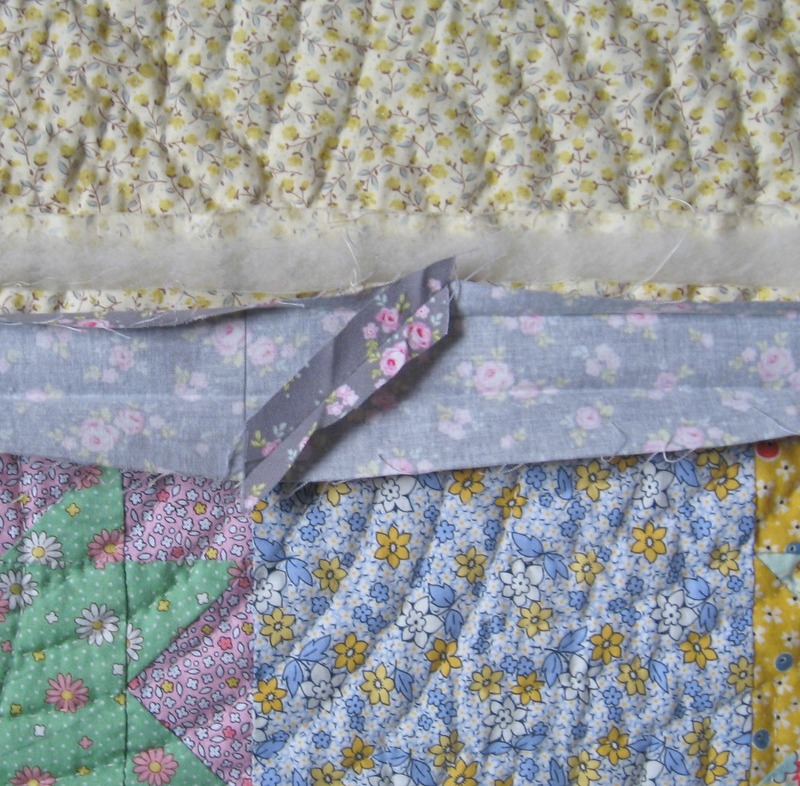 Once you’ve made your binding you’ll then want to join it to your quilt. As a rule I generally start somewhere in the middle of the bottom edge of my quilt. 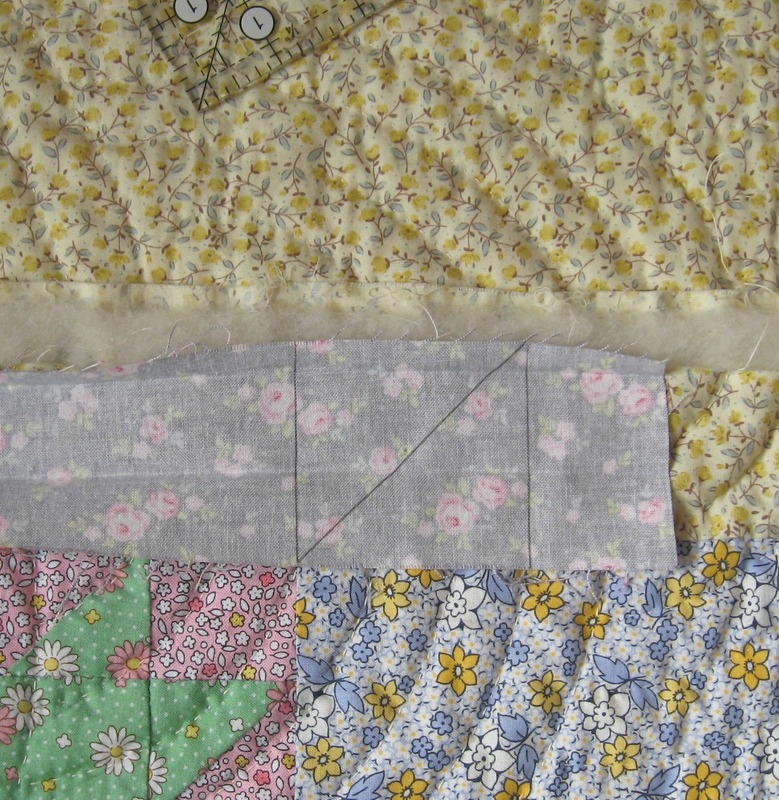 Lay your binding along the quilt and rather than using the binding right from the end instead allow yourself a spare bit or tail between six to eight inches or so before you begin pinning the binding into position. 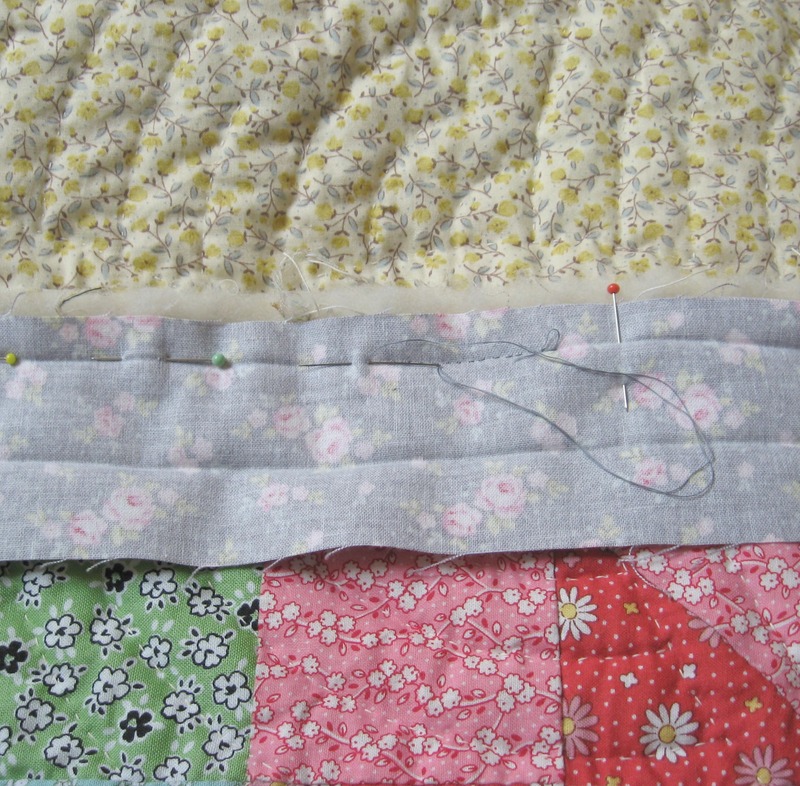 Open up your binding and position it along the edge of your patchwork, carefully pin along the pressed line. I like to pin about 10 to 12 inches of binding into place at a time, more than that and the pins can get a bit prickly in your lap, and I find they also have the tendency to fall off (to only be found later by “Colin”* and his magnetic feet). Using a “sharp” needle (“sharps” are long, fine and aptly named, very sharp. 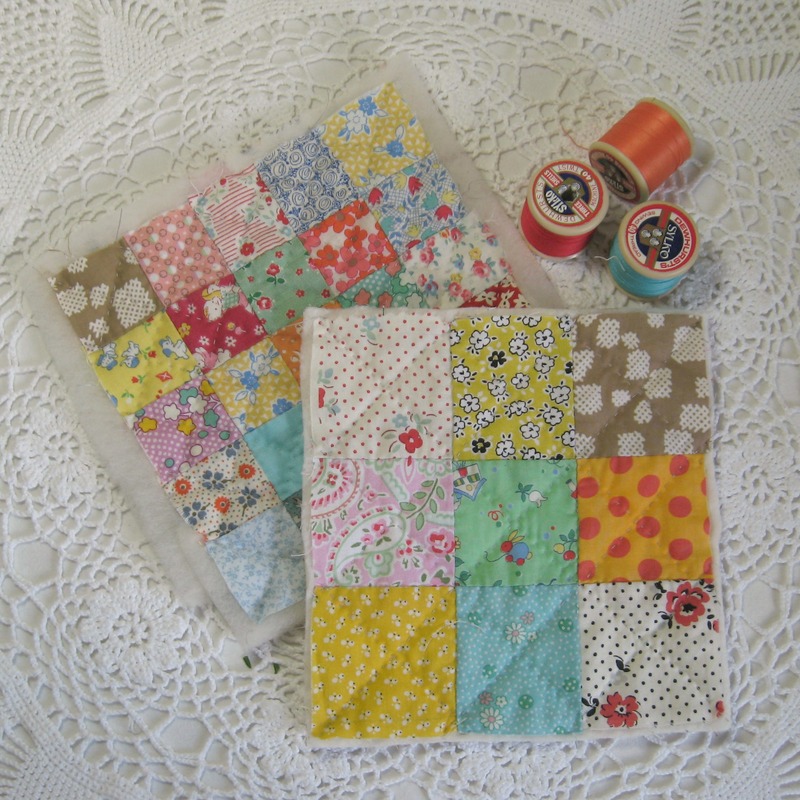 They are perfect for sewing patchwork and for sewing the binding into place) and a thread colour that matches your binding, make a small back stitch though the layers of the quilt, and then over stitch it so it is super secure. When you turn your work over you’ll be able to see a tiny row of stitches along the backing fabric. These will act as a guide when you turn the binding over and sew it to the back. 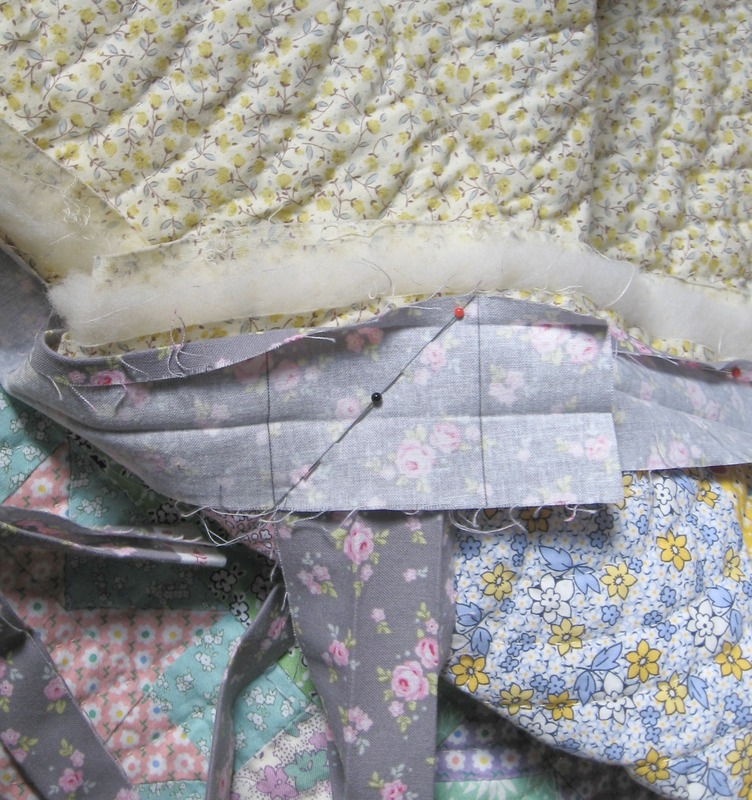 Sewing the corners is a bit tricky…..(at this point I either pop the kettle on and make a pot of tea, or have a Werther’s Original. Armed with those I’m invincible!) 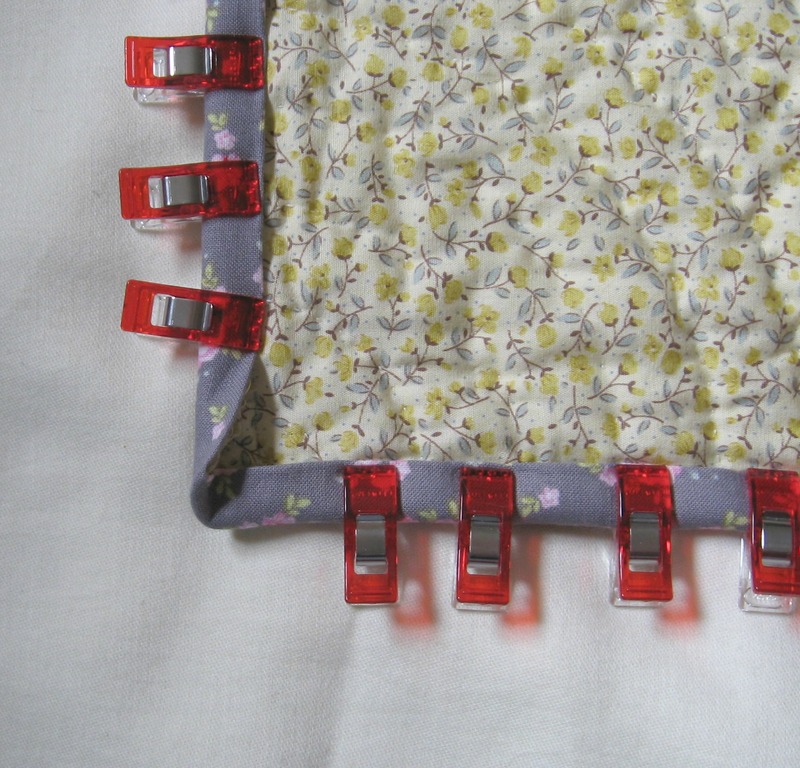 Lay the binding flat along the edge and allow it to drape over towards the left….gently score with a thumb nail along the edge of the left side of the patchworks’s raw edge and mark with a pin. With a second pin (the grey headed one) measure over 1/4 of an inch and pin the spot. 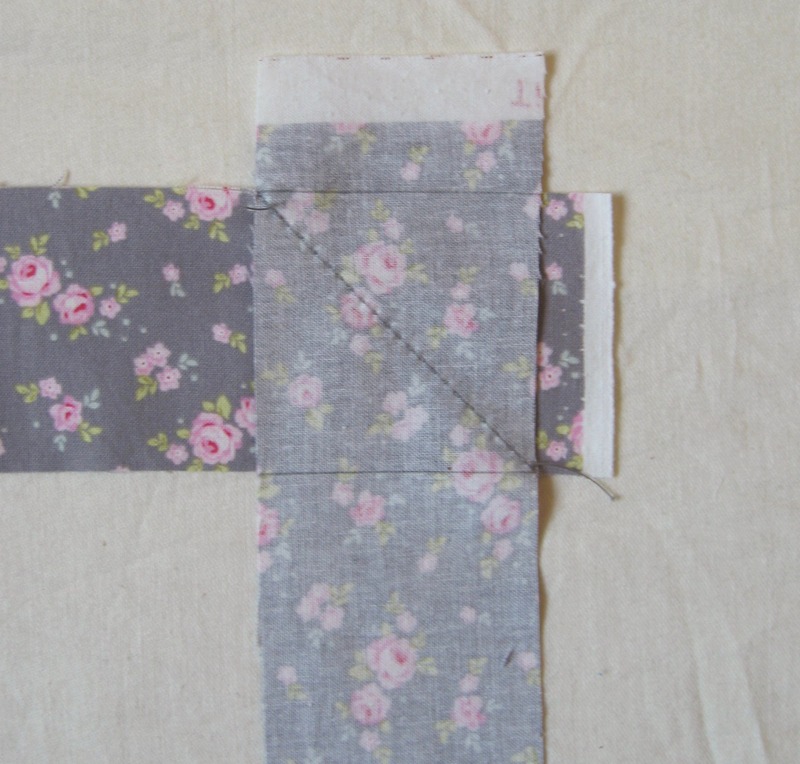 Now fold over the binding so it forms a diagonal edge in the corner. Gently press the fold with your thumb nail. If you’re worried it’s going to wriggle about then you can pin it into place. 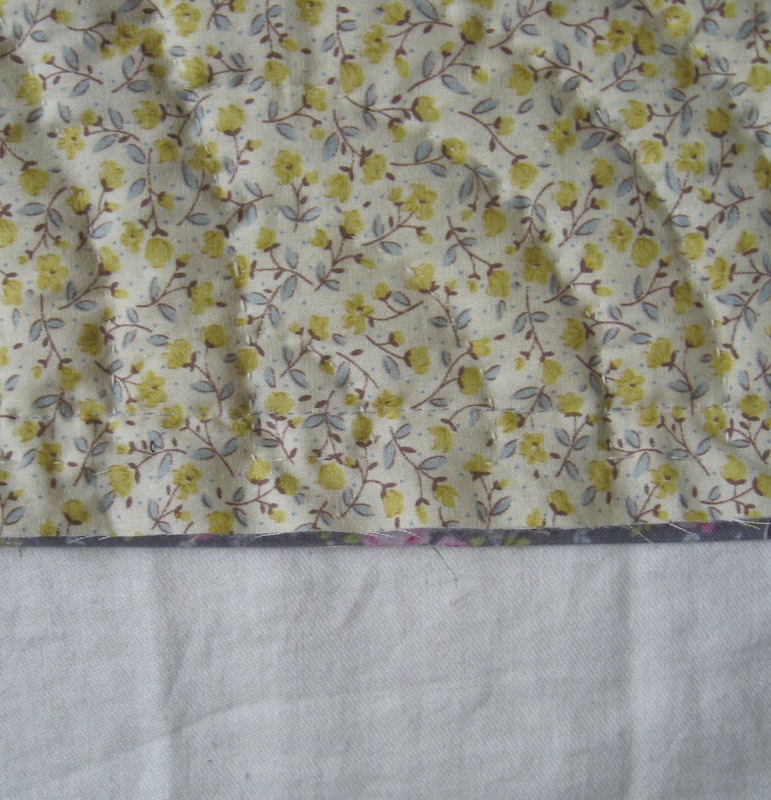 Then fold the binding back down along the left hand side. 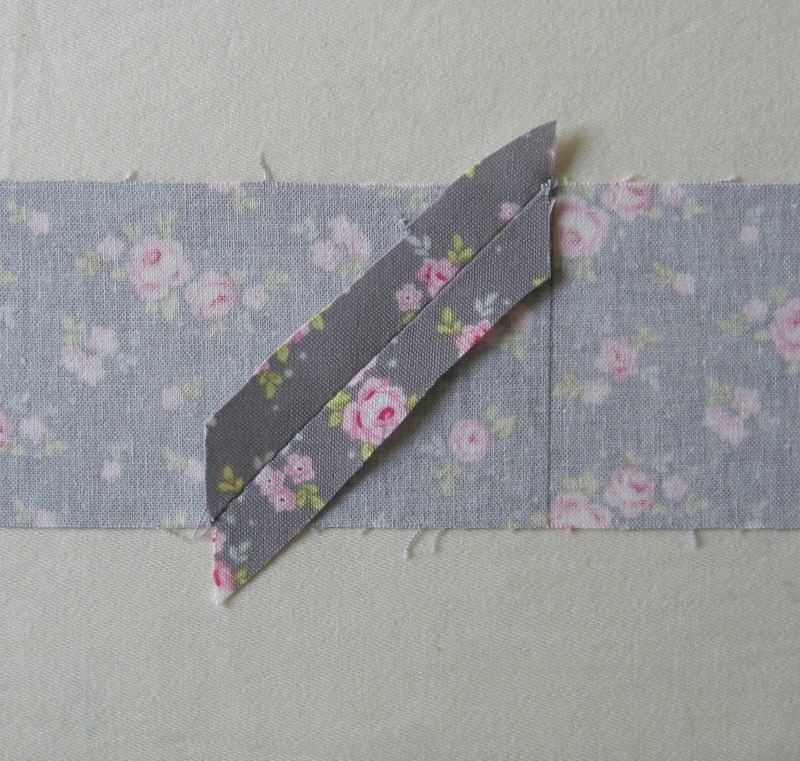 You need to line up the binding with the raw edge of the binding where you’ve just sewn. 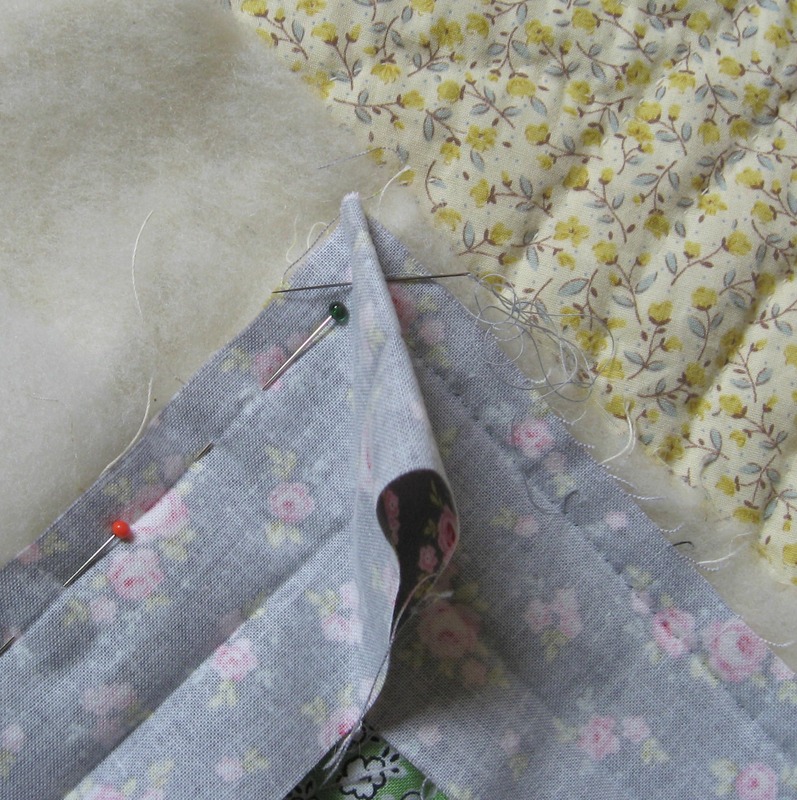 A little flap of fabric will be formed at the top of the right hand side of the binding. Pin the flap so it doesn’t shift about, rotate the quilt round and then pin along the pressed line of the binding on what is now the new top side. Un-tuck your needle, now you want to carefully push it through the last stitch made (on the left hand side of the stitch) and bring it out the other side of the tuck. You need to make sure you don’t sew through the fold made underneath the top section of binding, so with the needle in position you can carefully peer down through the layers from the top to check the needle hasn’t poked through the binding underneath, if the needle has poked through then you can just un-slide it a little so the tip can move along where it needs to come out. (this sounds a lot more confusing than it is. If you make a test piece you will see what I mean). 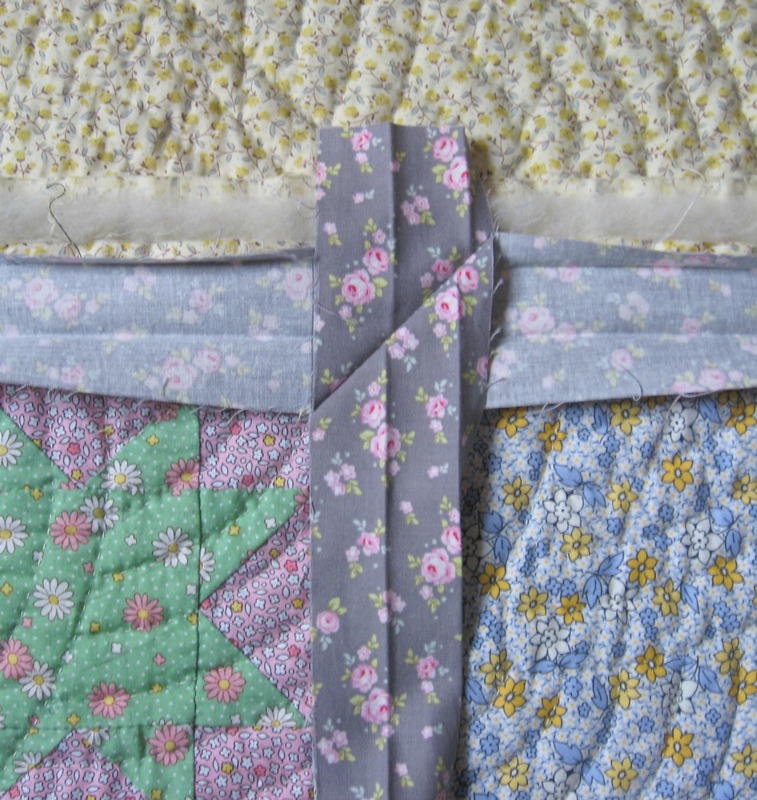 When the needle tip comes out at the right place, make one small forward or straight stitch and then carefully make another on top before sewing along the rest of the pressed binding edge with small back stitches. When you’ve sewn some of the binding into position you’ll find you can fold the binding up on itself, and the corner forms a little concentina style overlap. 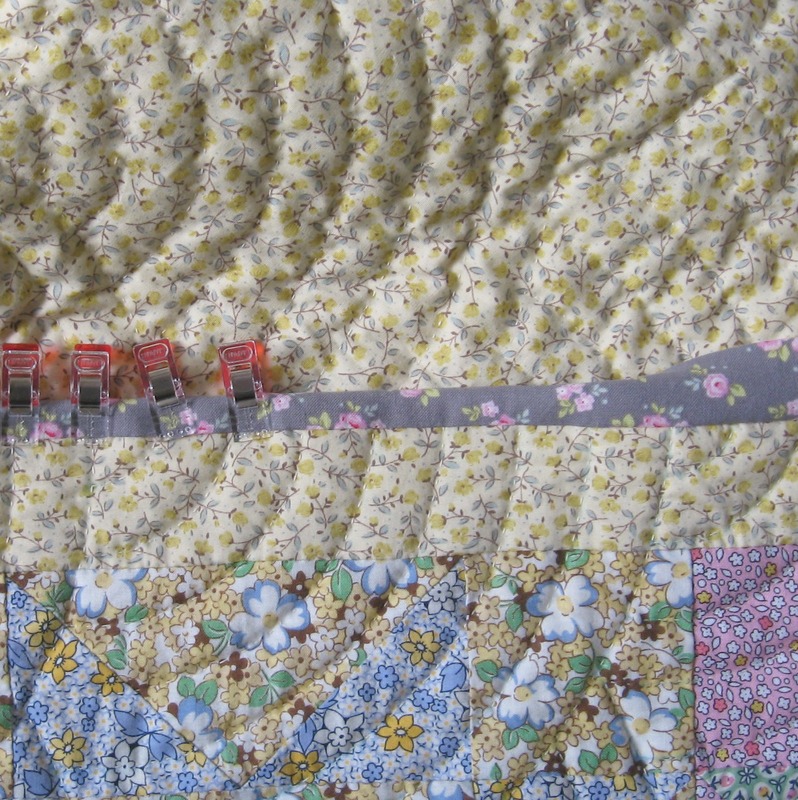 When you come toward the last side of the quilt, make sure you leave a nice sized gap for where you are going to be joining the two tail ends of the binding together. I generally like to leave about 10 inches so I have plenty of turning room. * a reference to The Great Escape and the pin on the floor. 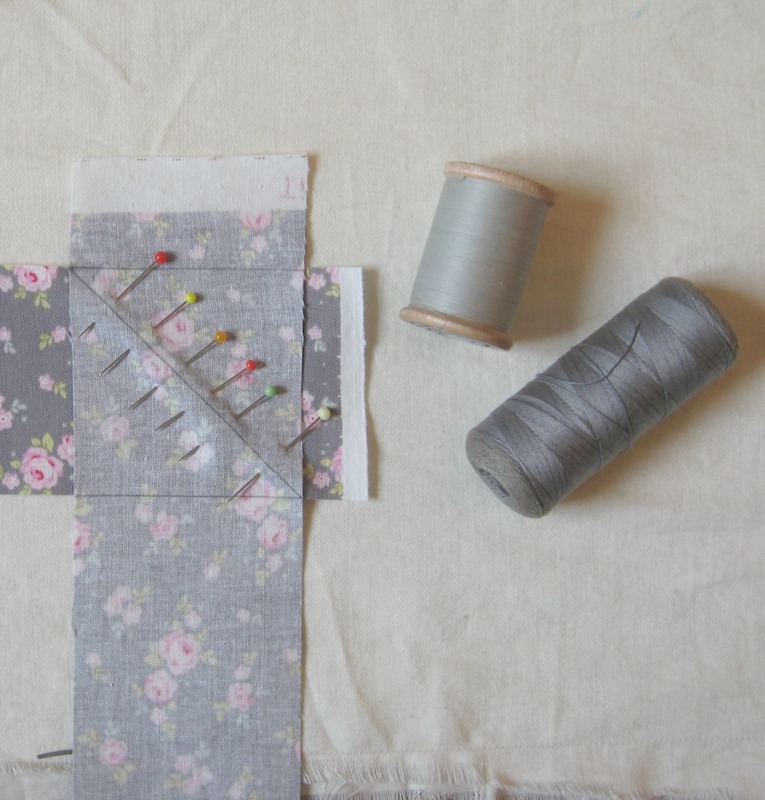 Making your own binding for edging a quilt isn’t hard and it means you can chose exactly what colour and print you want rather than the need to rely on what you see available in the shops. 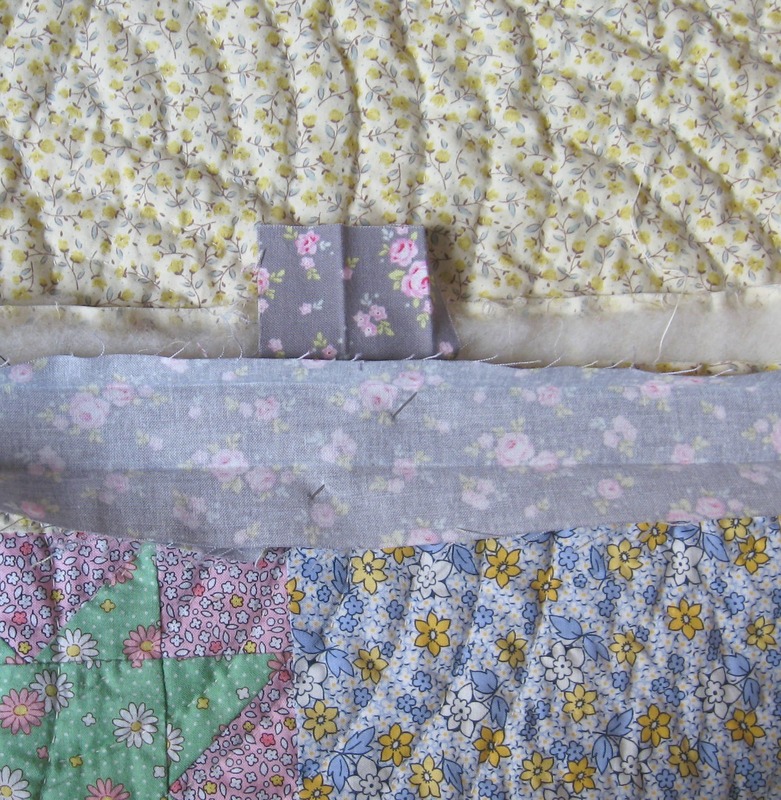 Although I use pre-cut vintage binding on many projects (such as trimming the sleeve and collar edgings on dresses) I always prefer to make my own binding for quilting. I’ve got a couple of those brilliant little binding gadgets that you slide the cut fabric through (all the time my fingers seem to be attempting the dance of death as they avoid steam from my iron) and use that when I’m edging pot holders or tea cosies….but I don’t use them for bed or lap quilts because I prefer my binding for those to be doubled. Anyway, I thought I’d show how I make my binding (this was the way my friend Alison patiently showed me many years ago)…you don’t really need any fancy equipment, though if you have one of those long transparent gridded rulers and a rotary cutter and cutting mat, hoorah…but I’ve made binding with a wooden ruler, pencil, and a pair of fabric shears before and it came out fine…. First of all measure the top and side of your quilt, then double that measurement. 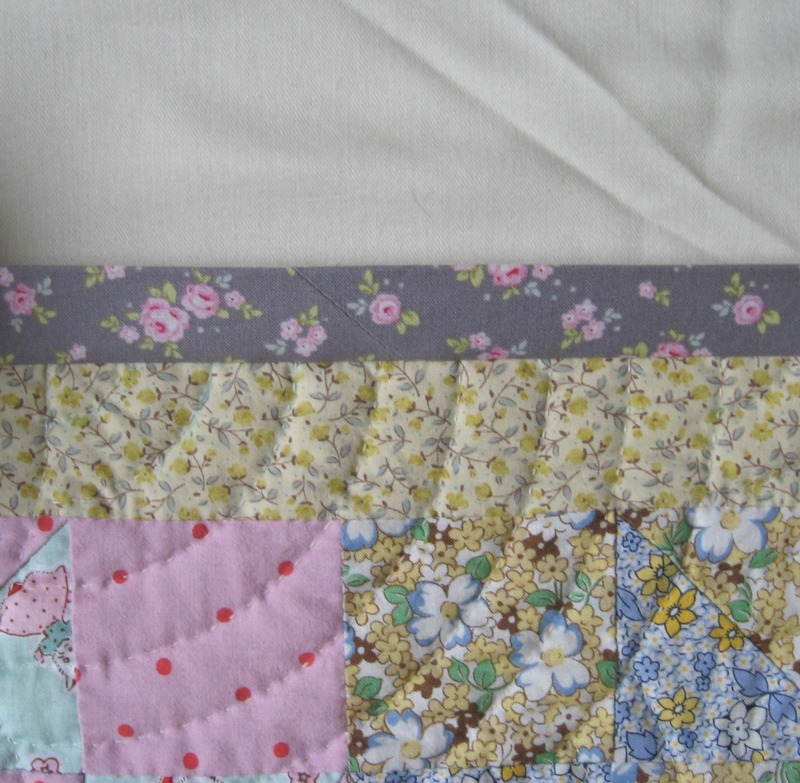 The binding has to go all the way around your quilt. Then add another 15 inches for turning the corners and to make sewing the two ends together a bit easier. Press your fabric so it’s as wrinkle free as possible, and then with a long gridded plastic ruler or yardstick , draw a straight line from top to bottom. Measure along the width of your binding 2 1/4 inches (it’s about 5.5cm….most quilting equipment comes from America and so is marked up in inches which means it’s easier to think in “old money” rather than new) and then either cut with a rotary cutter or draw another line (and cut later with fabric shears)….cut and draw as many lengths of binding as you need. For my example, my quilt is 30 inches wide and 40 inches long, so that is 30 + 40 x 2 (140) plus the extra 15 inches, which is 155 in total. The fabric being used for binding is 45 inches wide so when I cut my strips they will each be 45 inches long (and 2 1/4 inches wide) so 1 strip is 45 inches, 2 strips will be 90, 3 strips will be 135 and 4 strips will be 180 inches. So I need to cut 4 strips. It seems like there is going to be a lot of binding left, but each time you join the binding lengths you are using up some of that extra length allowance before you even begin to work any corners. Pin the two pieces of fabric together. 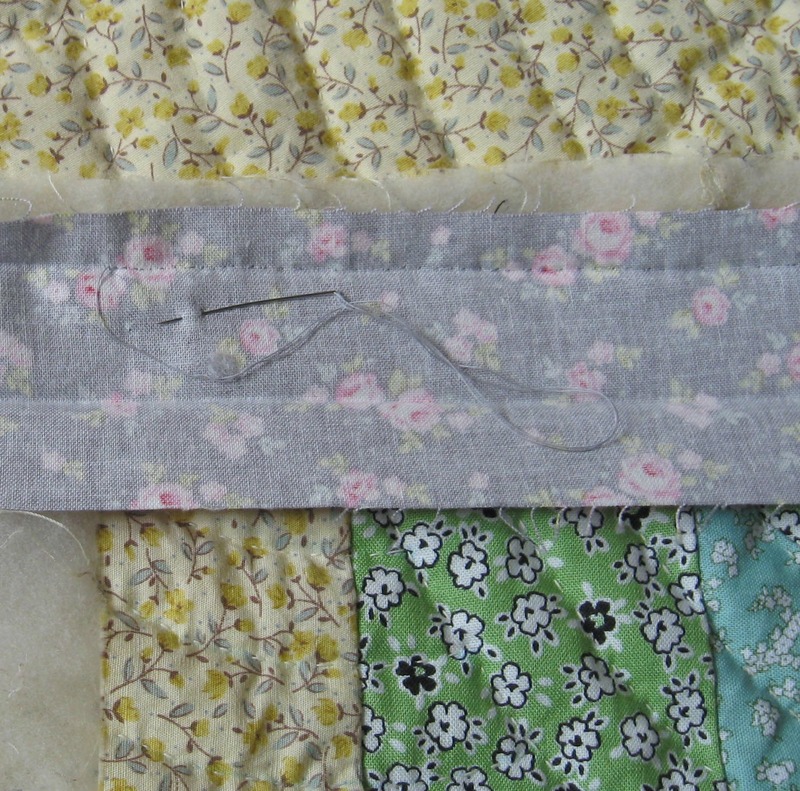 Sew along the diagonal line, starting and ending with a couple of over stitches. I rarely make a knot when I’m sewing patchwork and find a couple of over stitches makes for a neater and secure start and finish. Open out the two pieces of fabric and gently press open with a hot iron. When you look at it from the front you will have a nice straight edge top and bottom to the joined binding. Trim the sides of the binding to a generous 1/4 of an inch. Now with a hot iron (and avoiding steaming your finger tips where possible) press over the top edge of your binding about 1/4 of an inch. If you don’t want to judge by eye then by all means draw a line 1/4 of an inch away for the top edge and then carefully press along that. 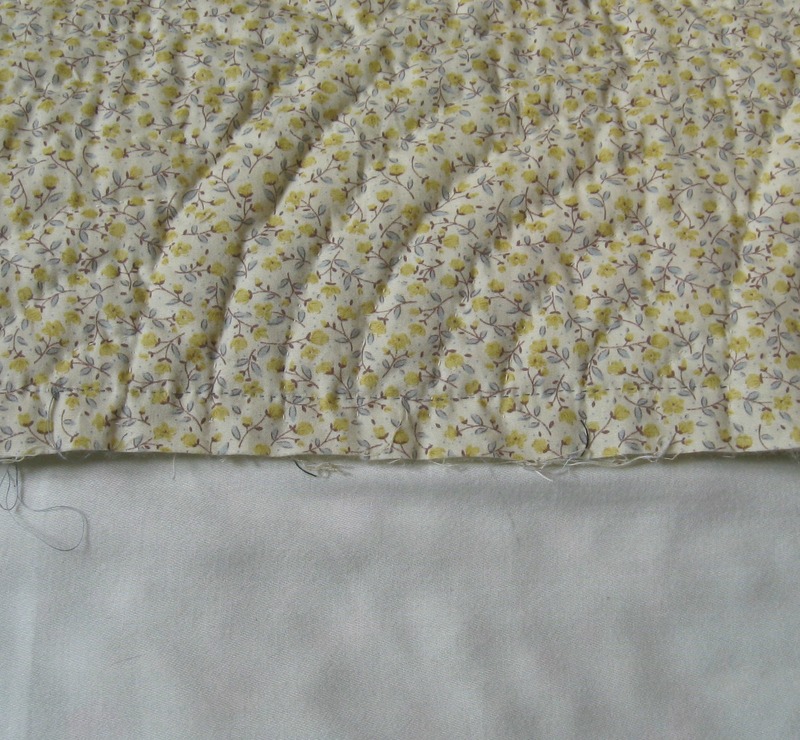 Now bring the bottom edge of the fabric up to the pressed over top edge, and then carefully press along the bottom. Your binding should now measure 1 inch wide, and have a 1/4 of an inch flap inside one edge only. When you use binding gadgets they create a flap on both sides and that is not what you are going for here. 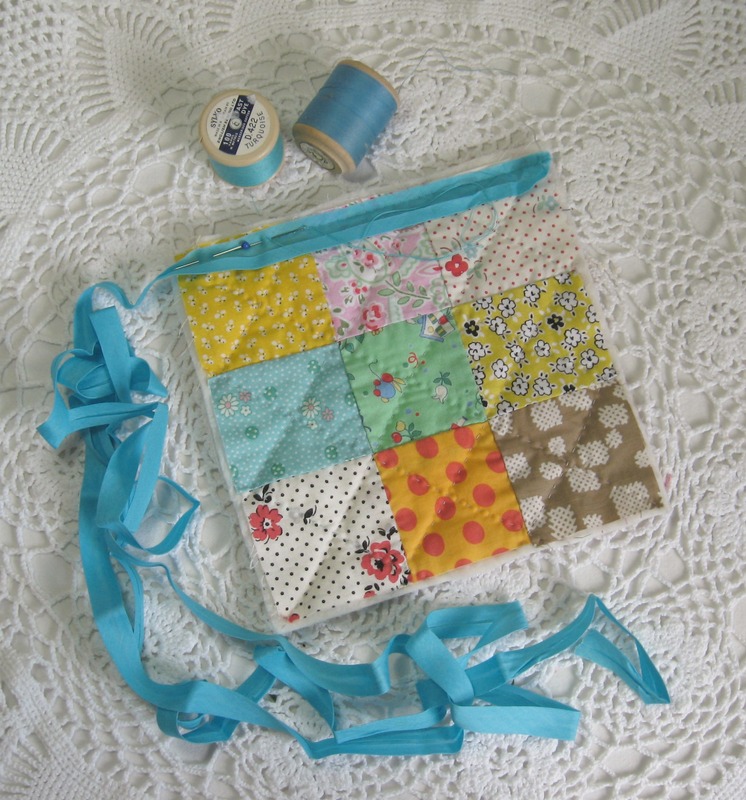 Carefully wrap your binding round your hand and fold it up (secure with a piece of ribbon or wool) and you are all set now to start sewing the binding to your quilt. If you need to calculate how much fabric to buy to make your binding then I’d measure the quilt and write out the length required on a piece of paper. Generally speaking fabric bolts are about 45 inches wide (which for your binding is measured as the length), and you know the binding needs to be 2 1/4 inches each section. 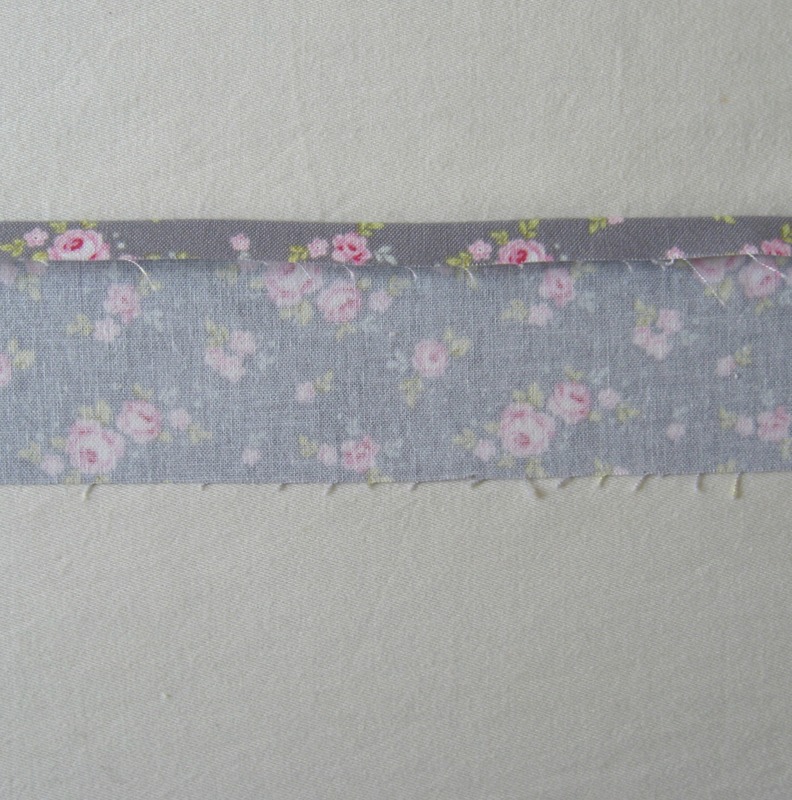 So for my example I’d need a piece of fabric that was cut wide enough for 4 x 2 1/4 inches (which is 11 inches). Depending where you are buying your fabric from, some shops may happily cut a piece 12 inches or a foot wide for you, however, if you’re buying on line then this won’t be an option so you will want to buy a piece that is about 20 inches wide (this is sold as either half a metre or as two joined fat quarters**)…..you’ll have some leftover but as all quilters know, leftovers soon find new homes in other projects. * and I’m writing down all the pieces of equipment that I find really helpful when I’m sewing patchwork or making a quilt so will post that in a few days. 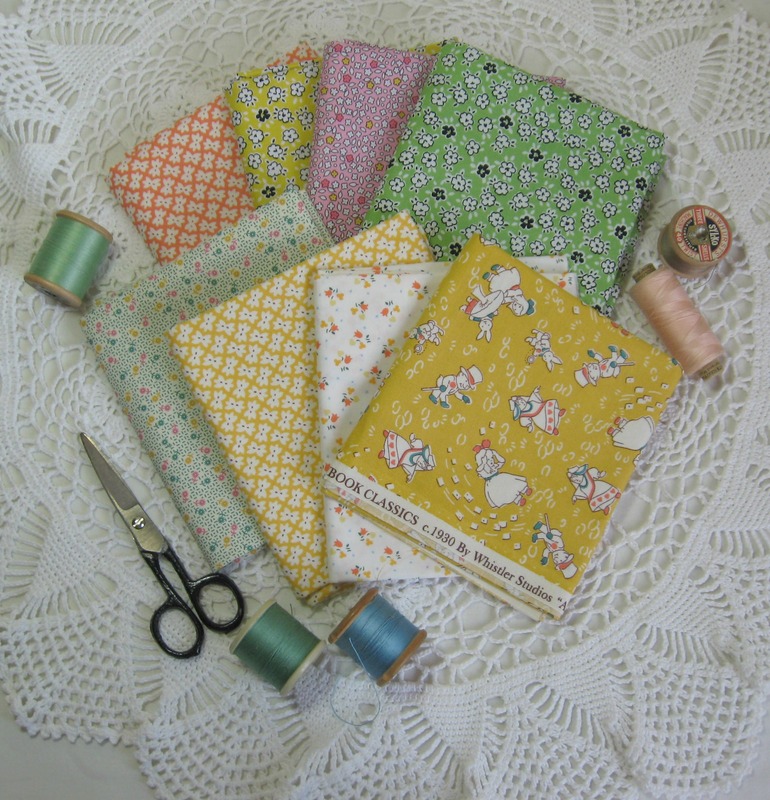 **if you’re buying on-line you might want to check how the fabric is sold, a few companies only sell fat quarters which is great for patchwork but bit wasteful if you are making a lot of binding. 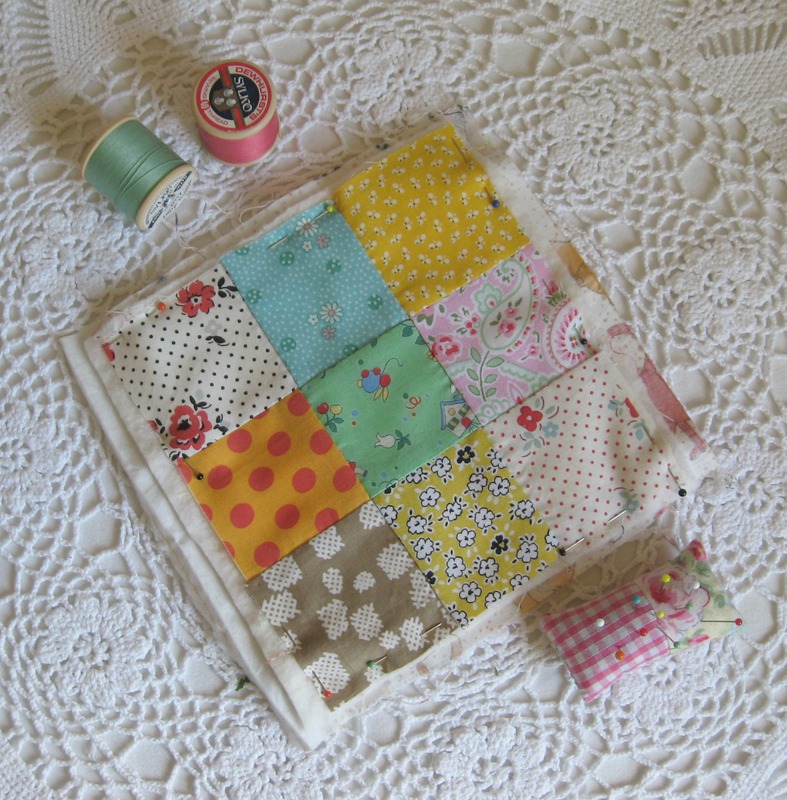 For smaller projects, like a cat quilt, then a thin quarter (10 inches wide) may well be enough. Basting and binding for Olive….. 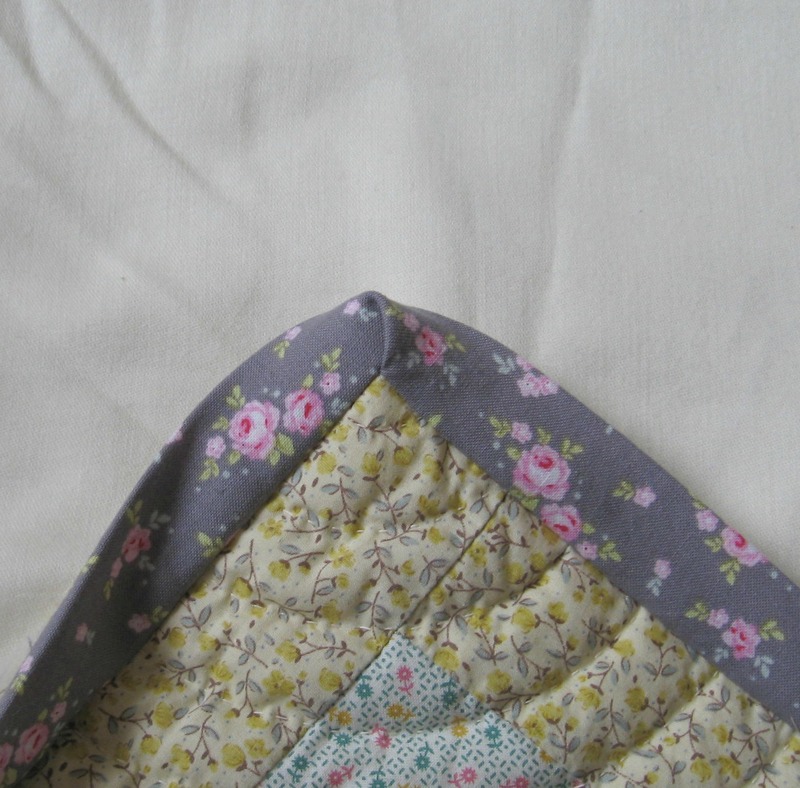 These are just a couple of sneaky early pictures of the quilt I’m sewing for Olive…. the light isn’t so good at the moment so apologies for the rather dark pictures. And I’ve used pure wool wadding (or batting) for the inside. 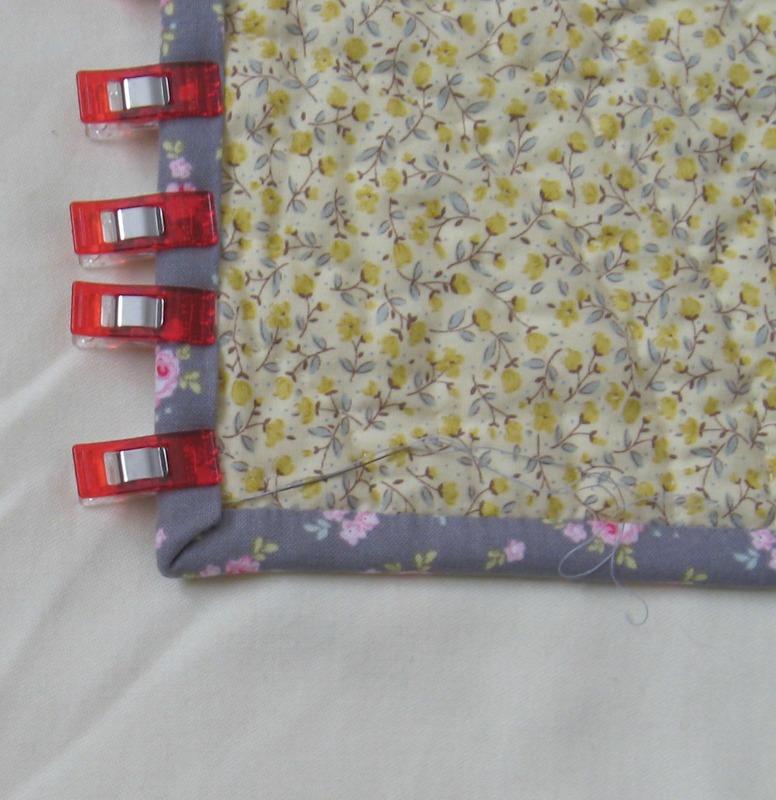 I’ve used this on almost all of my quilts and it is so lovely to use. 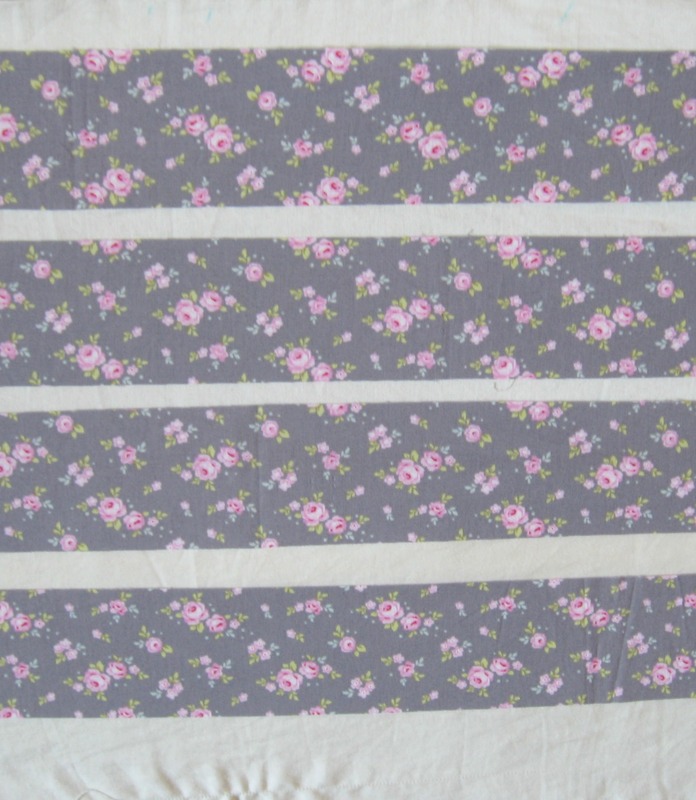 I’m using a fabric by Tilda for the binding, I’ve cut it 2 1/4 inches wide and I fold it over an inch before I pin it to the quilt. 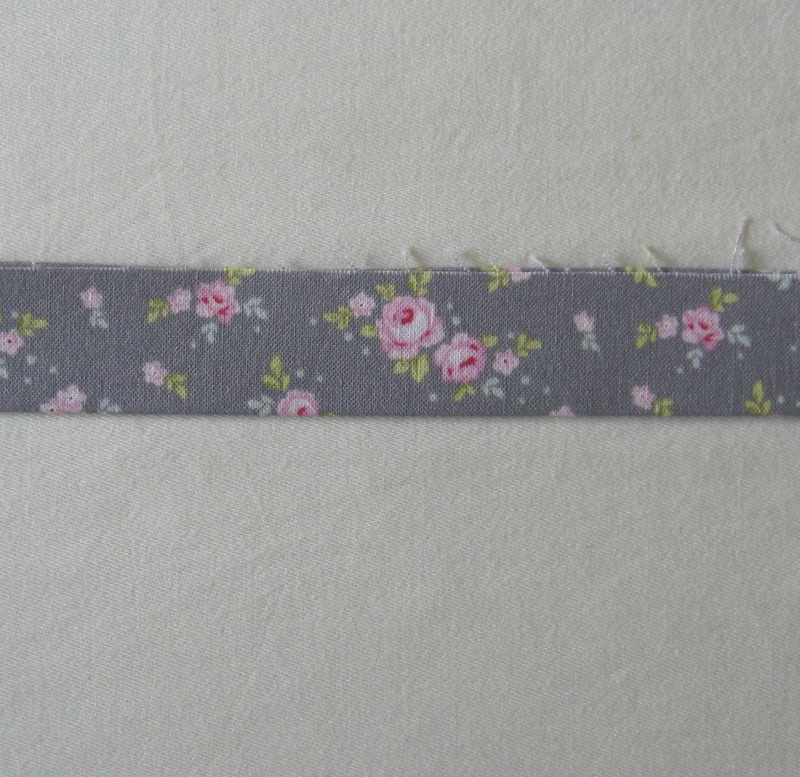 I know this is a more unusual width for binding but it is the size I prefer to work to work with. I’m back stitching the binding on the top layer of the fabric, only going through one layer of the binding fabric and all three layers of the quilt…at this stage I could kiss whoever invented the thimble!! Hoping to have the binding finished tomorrow morning and then I’ll be embroidering a tiny name tag for the back with Olive’s name. I’ll be writing a piece about how I baste and bind in bit more in depth in the next week or so but for now just wanted to show what I am doing.